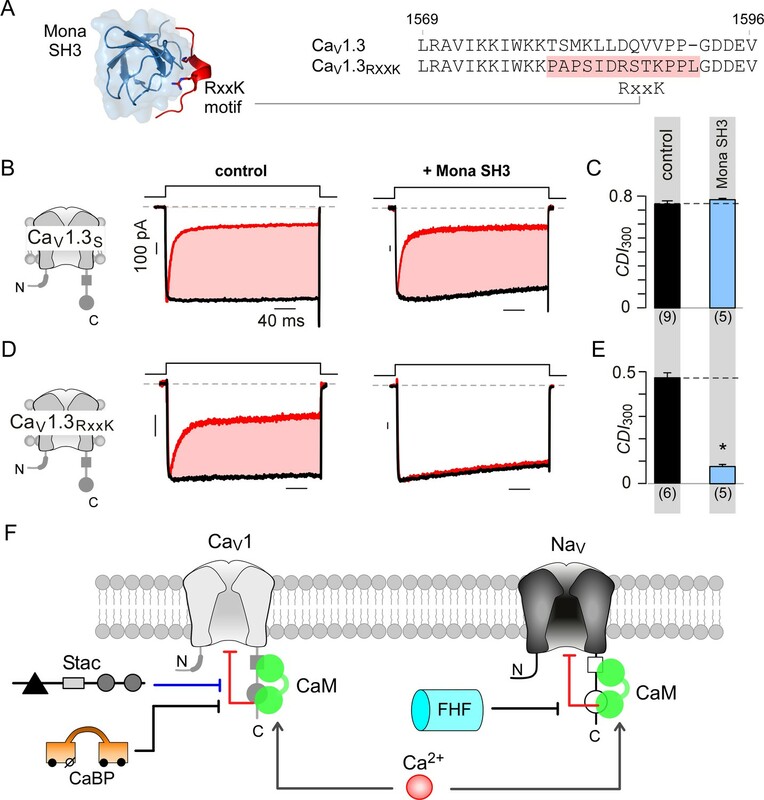 Calmodulin (CaM) serves as a pervasive regulatory subunit of CaV1, CaV2, and NaV1 channels, exploiting a functionally conserved carboxy-tail element to afford dynamic Ca2+-feedback of cellular excitability in neurons and cardiomyocytes. Yet this modularity counters functional adaptability, as global changes in ambient CaM indiscriminately alter its targets. Here, we demonstrate that two structurally unrelated proteins, SH3 and cysteine-rich domain (stac) and fibroblast growth factor homologous factors (fhf) selectively diminish Ca2+/CaM-regulation of CaV1 and NaV1 families, respectively. The two proteins operate on allosteric sites within upstream portions of respective channel carboxy-tails, distinct from the CaM-binding interface. Generalizing this mechanism, insertion of a short RxxK binding motif into CaV1.3 carboxy-tail confers synthetic switching of CaM regulation by Mona SH3 domain. Overall, our findings identify a general class of auxiliary proteins that modify Ca2+/CaM signaling to individual targets allowing spatial and temporal orchestration of feedback, and outline strategies for engineering Ca2+/CaM signaling to individual targets. Supporting vital biological functions, voltage-gated calcium (CaV1 and CaV2) and sodium (NaV1) channels are tuned by the Ca2+-binding protein, calmodulin (CaM) (Ben-Johny et al., 2015; Catterall et al., 2017; Saimi and Kung, 2002). NaV1 supports action potential initiation and propagation (Hille, 2001), while CaV1/2 initiate muscle contraction, neurotransmission, and gene transcription (Berridge et al., 2000; Clapham, 2007; Maier and Bers, 2002). 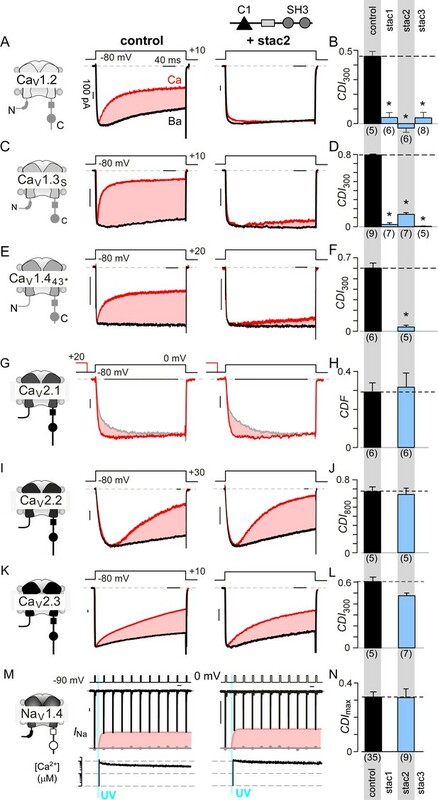 Despite divergent functions, these channel families share a conserved carboxy-tail element, termed Ca2+-inactivating (CI) module, that harbors CaM. Functionally, the CI module confers dynamic Ca2+-dependent regulation to CaV1, CaV2, and NaV1 that manifests as either inactivation (CDI) or facilitation (CDF), negative and positive feedback, respectively (Ben-Johny et al., 2015; Minor and Findeisen, 2010). Yet, this modularity poses a challenge – mechanisms that tune Ca2+/CaM-feedback must distinguish between structurally similar targets. Global inhibition of CaM indiscriminately alters many processes (Persechini and Stemmer, 2002). Given the abundance of CaM-regulated proteins, mechanisms that adjust CaM signaling to individual targets are crucial (Marshall et al., 2015; Saimi and Kung, 2002). 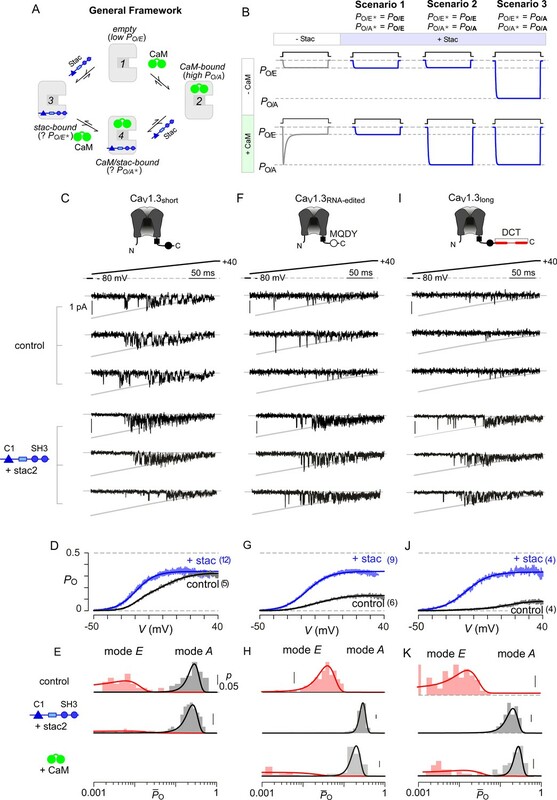 Physiologically, Ca2+-regulation of CaV1 is critical for cardiac electrical stability (Limpitikul et al., 2014; Mahajan et al., 2008), rhythmicity of oscillatory neurons (Chan et al., 2007; Huang et al., 2012), and vesicle release at ribbon synapses (Joiner and Lee, 2015). CaV2 modulation contributes to short-term synaptic plasticity and spatial learning (Adams et al., 2010; Jackman and Regehr, 2017; Nanou et al., 2016), while NaV1 modulation tunes excitability of skeletal and cardiac muscle (Pitt and Lee, 2016; Van Petegem et al., 2012). Consequently, aberrant channel regulation underlies numerous maladies including cardiac arrhythmias (Venetucci et al., 2012; Zimmer and Surber, 2008), neurological and neuropsychiatric disorders (Adams and Snutch, 2007; Striessnig et al., 2010; Zamponi, 2016), and skeletal myotonia (Cannon, 2015). Src homology 3 (SH3) and cysteine-rich domain (C1) proteins (stac) have emerged as attractive candidates that modulate CaV gating and trafficking (Polster et al., 2015; Suzuki et al., 1996). Initially identified in association with congenital skeletal myopathies as a structural protein that abets CaV1.1 plasmalemmal trafficking (Horstick et al., 2013; Linsley et al., 2017c; Polster et al., 2015), stac also suppresses CaV1.2 CDI (Campiglio et al., 2018; Wong King Yuen et al., 2017). Even so, the specificity of stac in tuning Ca2+-regulation of the broader CaV/NaV family, the underlying elementary mechanisms, and molecular determinants remain to be fully elucidated (Wong King Yuen et al., 2017). Stac isoforms (stac1-3) share a common architecture containing a C1 and two SH3 domains fused via a linker, and exhibit tissue-specific expression (Suzuki et al., 1996). Stac1/2 are expressed throughout the brain (Nelson et al., 2013; Suzuki et al., 1996), the peripheral nervous system (Legha et al., 2010), the retina (Wilhelm et al., 2014), and the inner ear (Cai et al., 2015), while stac3 is limited to the skeletal muscle (Nelson et al., 2013). Resolving mechanisms by which stac modulates CaV may furnish long-sought physiological insights (Suzuki et al., 1996). Evolutionarily distinct from stac, fibroblast growth factor (fgf) homologous factors (fhf1-4, fgf11-14) are unconventional fgf that lack a secretory signal and serve as intracellular regulators of NaV gating and trafficking (Goldfarb, 2005; Pablo and Pitt, 2016). Curiously, fhf interacts with the NaV CI module in close proximity to the CaM binding interface, suggesting interplay between these modulators (Wang et al., 2012; Wang et al., 2011b). Yet, functionally, fhf is thought to modulate only voltage-dependent fast inactivation (Goldfarb et al., 2007; Lou et al., 2005; Wang et al., 2011a), with changes in Ca2+-regulation unknown. Fhf isoforms are differentially expressed in the brain (Smallwood et al., 1996; Yan et al., 2014), peripheral nervous system (Ornitz and Itoh, 2001), and cardiac (Wei et al., 2011) and skeletal muscle (Kraner et al., 2012). Genetic variation in fhf4 is linked to spinocerebellar ataxia 27 (Coebergh et al., 2014) and fhf1 to cardiac arrhythmias (Wei et al., 2011), hinting at their relevance for regulating neuronal and cardiac excitability. By leveraging synergistic insights from CaV and NaV channels, we demonstrate that stac selectively diminishes Ca2+-regulation of CaV1. In-depth analysis shows that stac binds to a distinct channel interface from CaM and uses an allosteric mechanism to lock CaV1 into a high open probability (PO) gating mode. We further localize a minimal motif that recapitulates stac modulation of CaV1 gating. Paralleling stac-effect on CaV1, fhf reduces CDI of NaV1 with no effect on CaV1. In all, our findings point to a general class of auxiliary proteins that intercept CaM signaling to individual targets, allowing spatial and temporal orchestration of Ca2+-feedback. We sought to determine stac effect on CaV1, CaV2, and NaV1 channels in heterologous systems. Figure 1A shows baseline effects of stac on CaV1.2 (Campiglio et al., 2018; Polster et al., 2015; Wong King Yuen et al., 2017). Devoid of stac, CaV1.2 exhibits CaM-mediated CDI manifesting as enhanced decay of Ca2+ (red) versus Ba2+ current (black) when elicited using a step depolarization (Figure 1A, middle subpanel). As Ba2+ binds CaM poorly (Linse and Forsén, 1995), Ba2+-currents furnish a baseline measure of voltage-dependent inactivation (VDI) without CDI. Upon stac2 co-expression, CDI is diminished (Figure 1A, right subpanel). To quantify steady-state extent of inactivation, we measured the fraction of peak Ca2+ and Ba2+ current remaining after 300 ms depolarization, rCa and rBa (Figure 1—figure supplement 1A). The strength of CDI is quantified as CDI300 = 1 – rCa/rBa, the fractional Ca2+-dependent component of inactivation. Thus quantified, the population data confirm a reduction in CDI of CaV1.2 with stac2 (p=3.6 × 10−5; Figure 1B). Further analysis shows that both stac1 and stac3 isoforms also diminish CDI (p=2.0 × 10−5 and 7.1 × 10−5, respectively, Figure 1B and Figure 1—figure supplement 1A). Similarly, CaV1.3 short variant (CaV1.3S), a close homolog of CaV1.2, exhibits strong baseline CDI that is reduced on co-expression of stac1, stac2, and stac3 (p<1 × 10−5; Figure 1C–D and Figure 1—figure supplement 1B). Generalizing this phenomenon, stac2 also reduces CDI of CaV1.443* (p=3.2 × 10−5; Figure 1E–F; Figure 1—figure supplement 1C) (Tan et al., 2012). Stac specifically abolishes Ca2+/CaM-regulation in CaV1 channels. (A) Stac2 diminishes CDI of CaV1.2. Left, cartoon schematic shows CaV1.2. Middle, exemplar current traces evoked in response to +10 mV voltage-step shows robust CDI (rose shaded area) evident as enhanced current decay with Ca2+ (red) versus Ba2+ (black) as the charge carrier. Right, stac2 abolishes CDI. Steady-state levels of inactivation are assessed as the fraction of peak current remaining following 300 ms depolarization (rCa and rBa) and CDI = 1 – rCa/rBa. (B) Bar graph displays population data of CDI300 for CaV1.2 in the absence and in the presence of stac1, stac2, or stac3. Dashed line shows baseline CDI in the absence of stac for comparison. Each bar, mean ±S.E.M. obtained from specified number of cells (n). (C–D) Stac isoforms suppress CDI of CaV1.3S, the canonical short variant, as confirmed by both exemplar traces (C) and population data (D). Format as in (A) and (B). (E–F) Stac2 abolishes CDI of CaV1.443* assessed in response to +20 mV test pulse. Format as in (A) and (B). (G–H) Stac2 spares CDF of CaV2.1, as evaluated using a prepulse protocol. An isolated test pulse to 0 mV elicits Ca2+ currents with biphasic activation (gray, G). With a + 20 mV prepulse, channels are partially facilitated and the slow component of activation is reduced (red, G). The area between the two current traces (ΔQ), divided by τslow, yields facilitation (g). Bar graph plots, CDF = gCa – gBaH). Each bar, mean ±S.E.M from specified number of cells (n). (I–J) Stac2 spares CDI of CaV2.2 assessed in response to +30 mV test pulse. Here, CDI is evaluated following 800 ms of depolarization to accommodate slow inactivation kinetics, yielding CDI800. Format as in (A) and (B). (K–L) Stac2 spares CDI of CaV2.3. Format as in (A) and (B). (M–N) Stac2 spares CDI of NaV1.4. Both in the absence and presence of stac, NaV1.4 peak currents decline following a Ca2+ step (rose fit) (M). Gray dots, peak currents before uncaging. CDI = 1 – average peak INa of last three to four responses after Ca2+ uncaging / peak INa before uncaging. Bar graph plots maximal CDI observed with Ca2+ steps > 5 μM (N). Each bar, mean ±S.E.M. 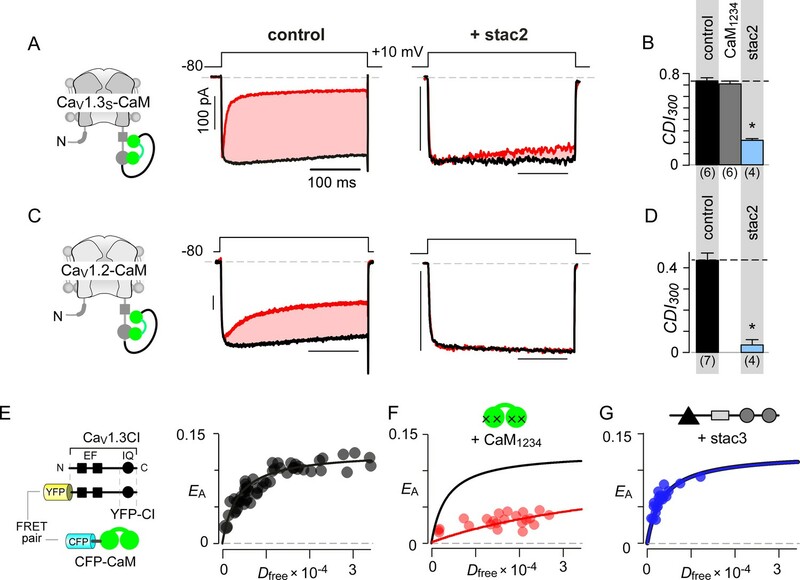 Encouraged by its pervasiveness, we considered whether stac alters Ca2+-dependent modulation of CaV2 isoforms that are abundant in the central nervous system. For CaV2.1, CaM elaborates both CDF and CDI (DeMaria et al., 2001; Lee et al., 2000). However, the Ca2+-sensitivity of CDI process is over 50-fold weaker than that of CDF, casting this negative feedback beyond physiological bounds (Lee et al., 2015). As such, we probed whether stac tunes CDF of CaV2.1 using a well-established prepulse protocol (DeMaria et al., 2001; Thomas and Lee, 2016). Figure 1G displays wildtype CaV2.1 currents in the absence of stac2. On presentation of an isolated test pulse to 0 mV, the activation of Ca2+ current follows a biphasic response (gray trace). Following a brief voltage prepulse, however, the ensuing test pulse yields enhanced Ca2+-currents with monophasic activation reflecting CDF (red trace). Further quantification revealed no change in CDF of CaV2.1 following the addition of stac2 in both exemplar current recordings (Figure 1G) and population data (Figure 1H; Figure 1—figure supplement 1D). For CaV2.2, CaM-regulation manifests as a kinetically slow CDI (Figure 1I) (Liang et al., 2003), that persists despite stac co-expression (Figure 1I–J; Figure 1—figure supplement 1E). Here CDI is quantified by metric CDI800 = 1 – rCa/rBa, measured following 800 ms of depolarization. Likewise, neuronal CaV2.3 also possesses robust CDI, which is spared with stac2 co-expression (Figure 1Figure 1K–L; Figure 1—figure supplement 1F). Lastly, we tested whether stac suppresses Ca2+-regulation of NaV1, related to CaV1. Although all NaV1 possess a CI module homologous to both CaV1 and CaV2 (Babitch, 1990), CDI that bears mechanistic similarity to CaV has been identified only in NaV1.4 (Ben-Johny et al., 2014). Unlike CaV, NaV channels do not convey Ca2+ influx that triggers Ca2+-feedback. We used rapid photo-uncaging of Ca2+ to produce a step-like increase in intracellular [Ca2+]i, whose magnitude is simultaneously monitored via fluorescent indicators. Figure 1M displays baseline Ca2+-regulation of NaV1.4. As CDI is kinetically slow in comparison to fast inactivation, we applied a train of step depolarizations evoked at 10 Hz to probe Ca2+-dependent effects (Ben-Johny et al., 2014). Without Ca2+-uncaging, peak NaV1.4 currents remained steady (gray dots). In response to an ~10 μM Ca2+ step, the peak Na current declined rapidly revealing CDI (red envelope). Stac overexpression, however, does not disrupt NaV1.4 CDI (Figure 1M–N; Figure 1—figure supplement 1G). Overall, these results show the specificity of stac in tuning Ca2+-regulation of CaV1 channels. We sought to identify molecular mechanisms that underlie selective CaV1 modulation by stac. As the stac effect here is inferred based on overexpression analysis, we determined relative concentration requirements for stac binding to CaV1 holo-channel complexes within the milieu of living cells. We used live cell FRET 2-hybrid assay (Erickson et al., 2001) to probe the interaction of CFP-tagged stac3 with YFP-linked CaV1.3S. As all three stac variants suppress the CDI of all CaV1 isoforms, we chose CaV1.3 as YFP-tethered channels and a repertoire of YFP-tagged intracellular loop peptides are readily available for in-depth binding analysis (Yang et al., 2014). Stac3 was selected for its high potency in suppressing CaV1.3 CDI (Figure 1D). Accordingly, we quantified FRET efficiency (ED) between FRET pairs co-expressed in individual cells. By leveraging stochastic expression of the FRET pairs in cells, we obtained a saturating Langmuir relationship between ED and the free acceptor concentration (Afree) permitting estimation of relative binding affinities (Kd,EFF). Thus probed, we obtained a CaV1.3 holo-channel affinity for stac3 of Kd,EFF = 1458 ± 251 Dfree units proportional to ~47 nM (Figure 2A). By comparison, similar analysis of CaM binding to CaV1.3 showed Kd,EFF = 700 Dfreeunits ~ 22 nM (Yang et al., 2014). Consequently, stac’s relatively high binding-affinity for CaV1.3 suggests that it may be a potent modulator even at low concentrations. Stac interacts with the channel carboxy-terminus. (A) Live-cell FRET 2-hybrid assay shows high-affinity interaction between CFP-tagged stac3 with YFP-tethered holo-CaV1.3 channels in the presence of auxiliary β2A and α2δ subunits. (B) Cartoon shows FRET pairs, CFP-stac3 with YFP-CI, YFP-PCI, and YFP-IQ of CaV1.3. (C) FRET-binding curves show robust binding of stac3 to both the CI and PCI segment while binding to IQ is weaker. (D) Bar graph summarizes the relative association constant, Ka,EFF, of stac2 binding to major channel intracellular domains. (E–F) Transferring CaV1.3S CI to CaV2.3 (CaV2.3/1.3 CI) unveils latent stac2-mediated suppression of CDI. Format as in Figure 1A – B. With holo-channel binding assured, we systematically scanned YFP-tagged CaV1.3 intracellular domains (Yang et al., 2014) for stac binding sites (Figure 2B; Figure 2—figure supplement 1A). We found that stac3 binds well to the CI region (Kd,EFF = 20697 ± 3023 Dfree~0.67 ± 0.1 μM, Figure 2C). By contrast, analysis of the amino-terminus, intracellular loops between domains I and II (I-II loop), domains II and III (II-III loop), and domains III and IV (III-IV loop) revealed far weaker binding (Figure 2D; Figure 2—figure supplement 1B–E). To further localize the putative binding loci, we subdivided the CI module into two: (1) a proximal CI segment (PCI) composed of dual vestigial EF hand and preIQ segments and (2) the IQ domain (IQ). The YFP-tagged PCI segment bound stac3 with approximately tenfold higher affinity (Kd,EFF = 17725 ± 3990 Dfree~0.58 ± 0.1 μM) than the downstream IQ domain (Kd,EFF = 204739 ± 25465 Dfree~6.67 ± 0.8 μM) (Figure 2C–D). In all, systematic FRET analysis reveals that stac binds to CaV1 CI relying on upstream elements including the dual vestigial EF hand and preIQ domains, an interface distinct from that for CaM (Bazzazi et al., 2013; Minor and Findeisen, 2010). To test for functional relevance of stac binding to the CaV1 CI module, we sought to confer stac-sensitivity to a stac-insensitive channel via a chimeric approach. We turned to CaV2.3 that lacks strong stac-mediated CDI suppression, yet forms functional chimeras with CaV1 (Mori et al., 2008; Yang et al., 2014). We replaced the CI region of CaV2.3 with the corresponding segment from CaV1.3 (CaV2.3/1.3 CI). Devoid of stac, CaV2.3–1.3 CI channels exhibit CDI isolated by high intracellular buffering (Figure 2E–F; Figure 2—figure supplement 1F). In contrast to wildtype CaV2.3, stac2 co-expression attenuated CDI (p=4.7 × 10−4, Figure 2E–F; Figure 2—figure supplement 1F), suggesting that CaV1 CI module is necessary for stac-mediated CDI suppression. 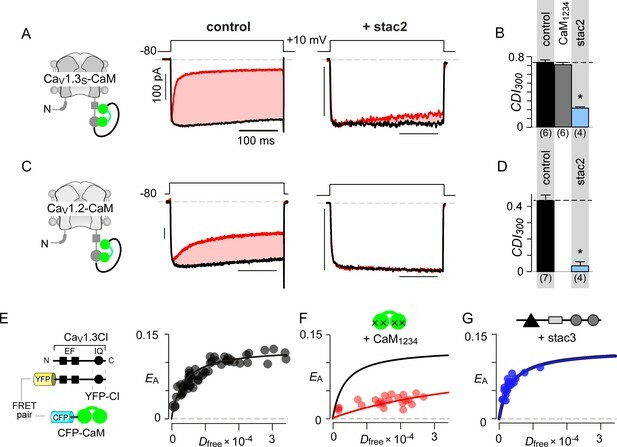 Given that both CaM and stac share the CI module as an effector site, two disparate mechanistic possibilities may allow suppression of Ca2+-regulation. First, stac may competitively displace Ca2+-free CaM (apoCaM) from its preassociation site. Second, stac may supersede CaM signaling to the channel pore via an allosteric mechanism. Systematic FRET analysis suggests that stac preferentially binds upstream CI elements (Figure 2D) while high-affinity CaM preassociation is supported via the IQ domain (Bazzazi et al., 2013; Minor and Findeisen, 2010), hinting that the two modulatory proteins may bind concurrently. To rule out competitive displacement of CaM preassociation, we covalently tethered CaM onto the CaV1.3 carboxy-tail using a poly-glycine linker (CaV1.3S-CaM) (Mori et al., 2004; Yang et al., 2014). This maneuver preserves CDI (Figure 3A left) and ensures a high local CaM concentration near CaV1 extending into the millimolar range, sufficient to protect the channel from a competitive inhibitor (Mori et al., 2004). Dominant-negative CaM1234 with its Ca2+-binding sites disabled, typically displaces intact apoCaM from the CI module thereby resulting in a loss of CDI for wildtype channels (Figure 3—figure supplement 1A–B) (Yang et al., 2014). CDI of CaV1.3S-CaM persists despite CaM1234 co-expression (gray bar, Figure 3B; Figure 3—figure supplement 1C–D). By contrast, CDI of CaV1.3S-CaM is diminished by co-expression of stac2 (p=3.8 × 10−6, Figure 3A–B; Figure 3—figure supplement 1E) and stac3 (p=4.5 × 10−4, Figure 3—figure supplement 1F). As a further test, co-expression of untethered CaV1.3S with both CaM and stac2 also showed low CDI (Figure 3—figure supplement 1G). We observed a similar fate for CaV1.2-CaM with stac2 (p=1.5 × 10−5, Figure 3C–D; Figure 3—figure supplement 1H). These findings suggest that stac does not need to dislodge CaM from its CaV1.3 carboxy-tail binding interface to exert functional modulation. Allosteric regulation of stac by interaction with the channel carboxy-terminus. (A–B) Stac2 suppresses CDI of CaV1.3S tethered to CaM. In contrast, fusion of CaM protects CaV1.3S from competitive inhibitors such as CaM1234. Format as in Figure 1A–B. (C–D) Stac2 suppresses CDI of CaV1.2 tethered to CaM. Format as in Figure 1A–B. (E) FRET 2-hybrid assay shows the high-affinity interaction of YFP-tagged CaV1.3 CI to CFP-tagged CaM with relative dissociation constant Kd,EFF ~4000 ± 291 Dfree units. (F) Co-expression of untagged CaM1234 with FRET pairs YFP-tagged CaV1.3 CI and CFP-tagged CaM results in a marked reduction in FRET efficiency. 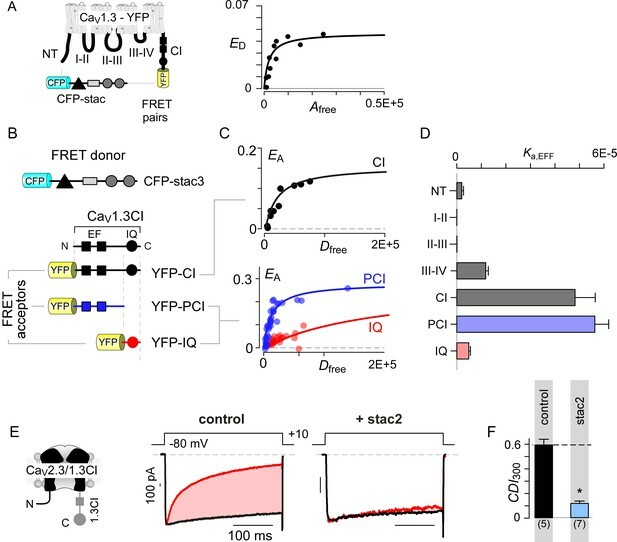 (G) Co-expression of untagged stac3 spares the binding of YFP-tagged CaV1.3 CI with CFP-tagged CaM, yielding an identical EA-Dfree relationship to that in the absence of stac3 (E). To test this possibility, we undertook FRET 2-hybrid assay comparing binding of CFP-tagged CaM to YFP-tagged CaV1.3 CI in the presence and absence of unlabeled stac3. If stac3 were to competitively dislodge CaM, then this binding is predicted to be weakened. At baseline, CaM binds to CaV1.3 CI with a relative dissociation constant, Kd,EFF ~4000 ± 291 Dfree units (Figure 3E) (Ben Johny et al., 2013). Upon co-expression of CaM1234, this baseline binding is weakened ~11 fold, yielding a relative affinity of 47153 ± 4815 Dfree units (Figure 3F). By contrast, co-expression of stac3 did not appreciably perturb CaM binding to the CI module with Kd,EFF = 4182 ± 330 Dfree units (Figure 3G). These results suggest that both stac and CaM act concurrently via distinct sites on the channel carboxy-tail, in contradiction with a competitive mechanism. Beyond Ca2+-dependent regulation, apoCaM binding tunes the baseline activity of CaV channels (Adams et al., 2014). Absent stac, CaV1 lacking prebound CaM adopts a low PO configuration (empty configuration, PO/E) while apoCaM binding switches channels into a high PO mode (CaM-bound configuration, PO/A) (Adams et al., 2014). Ca2+/CaM divests this initial enhancement in PO and returns channels into a low PO gating mode (PO/E) manifesting as CDI. The addition of stac as a regulatory agent enriches this modulatory scheme (Figure 4A). Three distinct scenarios may underlie suppression of Ca2+-regulation by stac (Figure 4B): (1) stac binding may pre-inhibit channels into the low PO configuration (PO/E) akin to Ca2+-inactivated channels and prevent further Ca2+-modulation, (2) stac may obstruct Ca2+/CaM regulation while allowing apoCaM to change baseline PO, (3) stac binding may allosterically lock channels into a high PO mode irrespective of CaM-binding status. For Scenario 3, it is possible that the baseline PO of CaV1.3 with stac may be distinct from that observed with CaM-overexpression. These three scenarios may be distinguished at the single-molecule level by assessing CaV1 PO under various CaM-bound conditions using low-noise electrophysiology. We focused on CaV1.3 given the rich assortment of post-transcriptionally modified variants with distinct CaM binding affinities (Bazzazi et al., 2013; Liu et al., 2010; Singh et al., 2008). We focused on three variants, CaV1.3S with high apoCaM affinity, and CaV1.3MQDY and CaV1.3L with low affinities. These variants possess distinct baseline PO and CDI and constitute a convenient platform to identify stac-dependent effects (Adams et al., 2014; Tan et al., 2011). Stac enhances the PO of CaV1.3. (A) A general four-state scheme for stac and CaM modulation. (1) CaV1.3S devoid of CaM and stac possess a low baseline PO (PO/E). (2) Without stac, apoCaM binding to CaV1.3S upregulates baseline PO (PO/A). Baseline PO of CaV1.3S bound to stac in the absence (configuration 3, PO/E*) and the presence of apoCaM (configuration 4, PO/A*) are unknown. (B) Schematic outlines three mechanistic possibilities for stac binding to CaV1 and their functional outcomes. Scenario 1, stac uniformly suppresses PO of CaV1 (PO/E) and abolishes CDI. Scenario 2, apoCaM tunes baseline PO of CaV1 despite concurrent stac binding. Stac, nonetheless, abrogates CDI. Scenario 3, stac uniformly upregulates the baseline PO of CaV1 and abolishes CDI (PO/A). (C) Top, cartoon shows the canonical CaV1.3S variant with a high apoCaM binding affinity. Single-channel analysis of recombinant CaV1.3S in the absence (middle) and presence of stac (bottom). In both panels, the unitary Ba2+ currents during voltage-ramp are shown between −50 mV and +40 mV (slanted gray lines, GHK fit). Robust CaV1.3 openings are detected in the absence and presence of stac. (D) Average single-channel PO-voltage relationship for CaV1.3S obtained from multiple patches in the absence (gray) and presence of stac2 (blue). Error bars indicate ±S.E.M. for specified number of patches and 80–150 stochastic records per patch. (E) Histogram shows distribution of single-trial average PO (P-O) for the voltage range -30 mV ≤ V ≤ +25 mV under control (top), stac-bound (middle), and CaM-bound (bottom) conditions. P-O-distribution is bimodal in the absence of stac corresponding to high PO (gray) and low PO (rose) gating modes. With stac, P-O-distribution is largely restricted to the high PO mode. (F–H) Single-channel analysis of a recombinant CaV1.3RNA-edited variant reveals a marked upregulation in the baseline PO in the presence of stac compared with control conditions in which apoCaM preassociation is weak. Absent stac or CaM, single-trial P-O-distribution is restricted to the low PO limits, With either stac or CaM, the high PO gating mode re-emerges. Format as in (C–E). (I–K) Stac also upregulates the baseline PO of CaV1.3L, an alternatively spliced variant, by stabilizing the high PO gating configuration. Format as in (C–E). First, we analyzed CaV1.3S in the presence and absence of stac (Figure 4C–E) to determine whether stac may promote channel entry into a low PO gating configuration. CaV1.3S is typically prebound to CaM at endogenous CaM concentrations given its high affinity (Adams et al., 2014). Ba2+ is used as a charge carrier to estimate baseline behavior of channels without confounding effects of CDI. A slow voltage-ramp (shown between −50 and +40 mV) evokes stochastic channel openings that approximate near steady-state PO at each voltage. Stochastic records displayed in Figure 4C show channel openings as downward deflections to the open level (gray curves) and closures correspond to the zero-current portions of the trace. Robust openings are detected both in the presence and absence of stac (Figure 4C). To estimate the steady-state PO – voltage relationship, we averaged many stochastic records to obtain a mean current that is divided into the open level and averaged over multiple patches. CaV1.3S variant exhibits high PO in the absence of stac (Figure 4D) (Adams et al., 2014). Upon stac2 co-expression, the open probability remains high with ~10 mV hyperpolarizing shift in the voltage-dependence of activation (Figure 4D). We scrutinized single-channel trials to assess changes in gating modes. Figure 4—figure supplement 1 displays 10 sequential trials of CaV1.3 single-channel activity evoked by voltage-ramps introduced at 12 s intervals both in the presence and absence of stac. In the absence of stac, CaV1.3S activity switches between epochs of high and low activity, as evident from the diary plot of average PO within individual trials (P¯o) (Figure 4—figure supplement 1B). Analysis of single-trial P¯o distribution reveals a bimodal distribution denoting discrete high and low PO gating modes (Figure 4E). Upon stac overexpression, channel activity is high as evident from P¯o-diary plots (Figure 4—figure supplement 1D) and single-trial P¯o distribution (Figure 4E). In contradiction with Scenario 1, stac-bound channels are not pre-inhibited; rather, channels preferentially adopt a high PO mode. To distinguish between the second and third mechanistic possibilities, we considered CaV1.3 variants with weakened apoCaM binding affinity that largely reside in the low PO configuration (Adams et al., 2014). Accordingly, we tested the baseline PO of CaV1.3MQDY, an RNA-edited variant whose central isoleucine within the IQ domain is substituted to a methionine, (Bazzazi et al., 2013; Huang et al., 2012) and an alternative splice variant CaV1.3L containing an autoinhibitory domain that competitively displaces CaM (Liu et al., 2010; Singh et al., 2008). In the absence of stac and under endogenous CaM levels, both CaV1.3MQDY (Figure 4F–G) and CaV1.3L (Figure 4I–J) open sparsely, exhibiting a diminished maximal PO consistent with channels lacking CaM (Adams et al., 2014; Bock et al., 2011). Indeed, single-channel trials of CaV1.3MQDY (Figure 4—figure supplement 2A–C) and CaV1.3L (Figure 4—figure supplement 3A–C) under endogenous levels of CaM reveal uniformly low activity, with single-trial P̄O distribution restricted to low limits (Figure 4H for CaV1.3MQDY; Figure 4K for CaV1.3L). CaM overexpression with both channel variants reveals the resurgence of epochs of high activity (Figure 4—figure supplement 2D–E; Figure 4—figure supplement 3D–E) and a bimodal P̄O distribution with a substantial fraction of trials corresponding to a high PO configuration (Figure 4H and K for CaV1.3MQDY and CaV1.3L respectively). Upon stac co-expression, robust channel openings re-emerge for both CaV1.3MQDY (Figure 4F–G) and CaV1.3L (Figure 4I–J) yielding an enhanced baseline PO akin to CaV1.3S variant (Adams et al., 2014). Scrutiny of single-channel trials for both channel variants reveal uniformly high channel activity (Figure 4—figure supplement 2F–G for CaV1.3MQDY; Figure 4—figure supplement 3F–G for CaV1.3L) and single-trial P̄O distributions are now within the high activity limits (Figure 4H and K) reminiscent of the CaM overexpression. The steady-state PO-V relations for CaV1.3S, CaV1.3MQDY, and CaV1.3L in the presence of stac closely approximate each other (Figures 4D, G and J). These findings demonstrate that consistent with Scenario 3, stac-binding locks CaV1.3 channels in the high PO configuration and effectively decouples the channel pore from CaM-dependent conformational changes. Moreover, these results highlight the dominance of stac over CaM in CaV1 modulation. With elementary mechanisms discerned, we turned to identify stac motifs functionally critical for allosteric suppression of CaM-regulation. Structurally, stac isoforms share a modular architecture composed of a C1 domain linked to two SH3 domains via a largely unstructured linker segment (U-linker region) (Suzuki et al., 1996). As these modular subcomponents typically recognize distinct ligands, we reasoned that their molecular functions may be separable (Cohen et al., 1995; Colon-Gonzalez and Kazanietz, 2006). We trisected stac2 to assess whether individual subcomponents can recapitulate functional regulation. We focused initially on C1 and tandem SH3 domains as these segments were recently shown to be critical for CaV1.1 binding and triadic localization in skeletal muscle (Campiglio and Flucher, 2017; Wong King Yuen et al., 2017). Co-expression of either segment, however, only minimally perturbed CDI of CaV1.2-CaM (Figures 5A, C and D; Figure 5—figure supplement 1A–1C). By contrast, the linker region by itself fully abolished CDI of these channels (p=8.9 × 10−6, Figure 5B and D; Figure 5—figure supplement 1D), recapitulating the effect of stac2 on CaV1.2. Stac U-domain is a minimal effect domain for suppression of CaV1 CDI. (A–C) To localize an effector motif for stac2, CDI of CaV1.2-CaM was quantified in the presence of three stac subdomains: (1) C1, (2) linker region, and (3) SH3-SH3. Exemplar traces in response to a +10 mV voltage-step depolarization show robust CDI of CaV1.2-CaM in the presence of C1 (A), and SH3-SH3 (C) domains. Co-expression of the linker-region is sufficient to suppress CDI of CaV1.2-CaM (B). Format as in Figure 1A. (D) Bar graph summarizes population data for CaV1.2-CaM CDI in the presence of the three stac subdomains. Each bar, mean ±S.E.M of CDI300 at +10 mV from specified number of cells. CDI levels in the presence (solid blue line) and absence (dashed gray line) of full-length stac2 is reproduced for comparison. (E) Bar graph shows degree of conservation for the linker region across 770 orthologs of stac2. A well conserved subsegment termed U-domain is shaded blue. (F–G) Co-expression of U-domain is sufficient to abolish CDI of CaV1.2-CaM (F) and CaV1.3-CaM (G). Format as in Figure 1A. (H) Bar graph displays population data for CDI of CaV1.2-CaM and CaV1.3-CaM in the presence of U-domain. Each bar, mean ±S.E.M of CDI300 at +10 mV from specified number of cells. Dashed line, baseline CDI for both channels in the absence of stac2. Blue line, CDI of both channels in the presence of full-length stac2. (I) Systematic alanine scanning mutagenesis of the U-domain reveals critical determinants for stac-mediated suppression of CaV1.2 CDI. For comparison, CaV1.2 CDI in the presence (blue line) and absence (black dashed line) of stac2 are shown. Stac2 mutants 200KVD/AAA, 203PVY/AAA, 206ETL/AAA fully abolish stac2-mediated CDI suppression. (J) Exemplar currents show that stac2 mutant 206ETL/AAA eliminates stac’s ability to suppress CaV1.2 CDI. Format as in Figure 1A. (K) Stac2 206ETL/AAA also fails to inhibit CDI of CaV1.3S. Format as in Figure 1A. To localize functional segments within the U-linker, we undertook bioinformatic analysis to identify highly conserved regions. We performed multiple sequence alignment of complete sequences of 770 stac orthologs using the MUSCLE algorithm (Edgar, 2004) and subsequently computed an empirical measure for the degree of protein sequence conservation at each position. The degree of conservation is defined as the likelihood of observing the consensus residue at each sequence position divided by the number of distinct residues observed at this position. By this algorithm, perfectly conserved residues will yield a unitary value, whereas poorly conserved residues will have a lower score. We identified a 22-amino acid stretch, termed the U-domain (‘unknown’ domain), exhibiting high conservation (Figure 5E, blue shaded region). Co-expression of U-domain diminishes CDI of both CaV1.2-CaM and CaV1.3-CaM (Figure 5F–H, Figure 5—figure supplement 1E–G). Thus informed, we undertook systematic alanine scanning mutagenesis of the stac2 U-domain to identify key residues (Figure 5I; Figure 5—figure supplement 2). Co-expression of mutant stac2 with triple alanine substitution of residues ETL[206-208] resulted in minimal disruption of CaV1.2 and CaV1.3 CDI (Figure 5J–K), suggesting that these residues are necessary. Further analysis revealed residues PVY[203-205] and KVD[200-202] to be critical for stac function (Figure 5I; Figure 5—figure supplement 2A–2C). Residues outside these loci minimally affected stac modulation of CaV1 (Figure 5I; Figure 5—figure supplement 2D–G). These findings confirm the necessity and sufficiency of U-domain as a minimal motif for preventing CaM-regulation of CaV1. Having identified a minimal U-domain for CDI suppression, we sought to assess potential physiological consequences of stac regulation in cardiac myocytes. As stac expression is yet to be identified in myocytes, we first probed its presence using immunohistochemistry with stac1- and stac2-specific antibodies. To ensure that the two antibodies reliably probe the two isoforms, we first evaluated the ability to detect stac isoforms exogenously expressed in HEK293 cells (Figure 6—figure supplement 1). Untransfected cells show minimal stac1 and stac2 immunostaining (Figure 6—figure supplement 1A–B), as confirmed by confocal imaging and population data. By contrast, immunostaining with stac1 antibody shows labeling with cells expressing stac1 but not stac2 or stac3. Similarly, labeling with stac2 antibody reveals substantial fluorescence (F > 300) in cells transfected with stac2 but not stac1 or stac3. Thus informed, we assessed expression and localization of stac isoforms in cardiac myocytes (Figure 6—figure supplement 1C–F). Analysis of acutely dissociated adult guinea pig ventricular myocytes (aGPVMs) showed stac2 labeling but not stac1 (Figure 6—figure supplement 1C). Consistent with these findings, immunoblotting with stac2 antibody showed ~50 kDa signal in stac2-transfected HEK293 cells but absent from untransfected cells, confirming the ability of the antibody to detect stac2 (Figure 6—figure supplement 1G). Analysis of aGPVM lysate revealed likely endogenous stac2 with a similar molecular weight to that of recombinant stac2 in HEK293 cells (Figure 6—figure supplement 1G). Given this baseline expression, we next considered potential effects of fluctuations in ambient stac levels. We synthesized the U-domain of stac2 as a peptide and delivered it via pipette dialysis to acutely elevate the myocyte’s cytosolic concentration. We validated the synthesized peptide by testing its effect on recombinant CaV1.2 expressed in HEK293 cells (Figure 6A). Following pipette dialysis of the U-peptide, CDI of CaV1.2 was reduced as evident from exemplar currents and population data (Figure 6B–C; Figure 6—figure supplement 2A–B). Thus affirmed, we isolated ventricular myocytes from adult guinea pigs (aGPVMs) to probe changes in CDI of native CaV channels and action potential duration in response to changes in stac levels (Figure 6D). Devoid of U-domain peptide, endogenous Ca2+ currents in ventricular myocytes displayed CDI, establishing baseline levels of CaM-regulation (Figure 6E, Figure 6—figure supplement 2D). Pipette dialysis of U-peptide reduced CDI in myocytes (Figure 6E–F, Figure 6—figure supplement 2E). The reduction in overall inactivation of Ca2+ currents suggest that fluctuations in stac levels may markedly alter action potential waveforms. To test this possibility, we obtained current-clamp recordings of aGPVMs and compared action potential waveforms in the presence and absence of U-peptide. Figure 6G shows typical voltage profiles of action potentials in aGPVMs paced at 0.5 Hz. Waveforms are stable between traces and the mean action potential duration (APD80), the duration of time when the action potential is at least 80% of its peak voltage, is 277.9 ± 31.37 ms (mean ±S.E.M., n = 6). Figure 6H displays the complement of the cumulative distribution of APD80. When the peptide is added to the internal solution, APD80 is enhanced to 740.1 ± 105.49 ms (n = 6) (Figure 6G–H). Thus, the U-peptide both alters the CDI of endogenous cardiac CaV1, prolongs APD, and may ultimately destabilize rhythmicity of the heart. Synthetic U-domain peptide is sufficient for physiological perturbations. (A) Schematic illustrates pipette dialysis of custom synthesized U-domain peptide in CaV1.2 heterologously expressed in HEK293 cells, a strategy that emulates acute elevation of cytosolic stac2 levels. (B–C) Exemplar traces and population data confirm that pipette dialysis of U-domain suppresses CDI of recombinant CaV1.2 in HEK293 cells. Format as in Figure 1A–B. Control relation in (C) is duplicated from Figure 1B. (D–F) Pipette dialysis of U-domain abolishes CDI of endogenous L-type current in freshly dissociated ventricular myocytes from adult guinea pigs as evident from exemplar traces and bar graph summary of population data. To eliminate T-type current, the cells were depolarized to −40 mV for a period of 100 ms. Format as in (A-–C). (G) Exemplar action potential traces of aGPVMs paced at 0.5 Hz with (blue) and without (black) 0.5 μM U-domain in the internal solution. In the presence of U-domain, the action potentials are markedly prolonged (blue shaded area) consistent with a loss of CDI of native L-type current. (H) Complement of cumulative distribution (P(APD80 >t) of action potential durations (APD80) obtained in the presence (blue) and absence (black) of U-domain in the internal solution. Encouraged by the selectivity of stac for CaV1, we sought to identify other regulatory proteins that may tune CaM-signaling to related channel families. However, recognizing such modulators amidst ion channel signalosomes is challenging. Given that stac interacts with CaV1 CI module via the PCI element, we reasoned that other CaV and NaV interacting proteins that engage a similar interface may suppress CaM-feedback. Intriguingly, recent atomic structures show that fhf interacts with NaV1 CI module via the PCI interface (Figure 7A) (Wang et al., 2012). Yet, functionally, fhf isoforms are thought to modulate only voltage-dependent gating properties, with effects on Ca2+/CaM-regulation unknown (Goldfarb et al., 2007; Lou et al., 2005; Wang et al., 2012). To test whether fhf alters NaV CDI, we undertook quantitative Ca2+ photo-uncaging of the skeletal muscle NaV1.4 isoform. We focused here on fhf1b given its modest baseline expression in skeletal muscle and pathological enrichment in critical illness myopathies (Kraner et al., 2012). Figure 7B reproduces baseline levels of CDI for NaV1.4 under control conditions. Co-expression of fhf1b abolished CDI (Figure 7B–C; Figure 7—figure supplement 1A), unveiling a novel role of fhf in tuning Ca2+-feedback of NaV channels. To assess selectivity, we probed whether fhf alters CDI of CaV1.3. In comparison to control conditions, fhf co-expression spared CaV1.3 CDI (Figure 7D–E; Figure 7—figure supplement 1B) suggesting that fhf may be a selective modulator of NaV1. Fhf uses an allosteric mechanism to abrogate Ca2+-feedback of NaV1.4. (A) Structural comparison of NaV1.5 CI (green) in the presence of CaM alone (cyan, left) or both CaM (cyan) and fhf1b (purple). Fhf binding changes baseline conformation of CaM on NaV1 CI. (B–C) Co-expression of fhf1b abolishes CDI in NaV1.4 evoked via Ca2+ photo-uncaging. Format as in Figure 1M–N. Control data are reproduced from Figure 1M–N for comparison. (D–E) In sharp contrast, strong overexpression of fhf1b does not alter CDI of CaV1.3S. Format as in Figure 1A–B. Control data reproduced from Figure 1D for comparison. (F–G) Fhf1 suppresses CDI of NaV1.4 tethered to CaM. Fusion of CaM protects NaV1.4 from competitive inhibitors such as CaM1234 (G). Format as in Figure 1M–N. (H) Structure of CaV1.1 upstream CI elements (blue) composed of dual vestigial EF hands and preIQ segments isolated from cryo-EM structure of CaV1.1 (PDBID, 5GJV). This domain is the primary interface for stac interaction in the CaV1 CI. (I) Structural overlay of upstream CI elements of CaV1.1 (PDBID, 5GJV) and NaV1.5 (PDBID, 4DCK) shows highly conserved dual vestigial EF hand segments while the fhf binding site is structurally divergent. (J) The divergence in the fhf binding interface in CaV1.1 in comparison to NaV1.5 would introduce a steric clash that prohibits fhf binding to CaV channels. Mechanistically, functional results along with atomic structures of NaV1 CI bound to CaM and fhf yield insights on mechanisms for CDI suppression (Gabelli et al., 2014; Wang et al., 2012; Wang et al., 2014). Both fhf and CaM bind concurrently to NaV1 CI (Wang et al., 2012; Wang et al., 2014), with fhf binding triggering a conformational rearrangement of CaM (Figure 7A) (Gabelli et al., 2014; Wang et al., 2012). To experimentally validate allostery, we followed our strategy with CaV1.3 and tethered CaM to NaV1.4 carboxy-tail. Reassuringly NaV1.4-CaM exhibits robust baseline CDI (Figure 7F; Figure 7—figure supplement 1C). Whereas dominant negative CaM1234 typically abolishes CDI of NaV1.4 (Ben-Johny et al., 2014), NaV1.4-CaM exhibits robust CDI despite CaM1234, confirming the protective nature of tethered CaM against competitive inhibitors (Figure 7G; Figure 7—figure supplement 1D). Co-expression of fhf1b, however, reduces CDI of NaV1.4-CaM (Figure 7F–G; Figure 7—figure supplement 1E). Thus, like stac modulation of CaV1, fhf overrides CaM signaling to NaV1.4 despite a tethered CaM, suggesting that fhf acts in allostery. To garner a structural perspective, we turn to NaV1.5 CI/fhf complex (Figure 7A) as the atomistic basis of the stac/CaV1 CI interaction is unknown (Wang et al., 2012; Wang et al., 2014; Wong King Yuen et al., 2017). Whereas the dual-vestigial EF hand segments of NaV1.5 and CaV1.1 are similar (Figure 7H–I), the fhf binding interface of NaV1.5, including the preIQ loop diverges from corresponding segments of CaV1.1 and introduces a steric clash (Figure 7I–J) (Wang et al., 2012; Wu et al., 2016). Thus, by leveraging structurally distinct loci on the CI module, fhf selectively diminish CaM signaling to NaV channels. These findings point to a class of auxiliary proteins that selectively adjust Ca2+-dependent feedback to individual ion channel targets. As both stac and fhf tune Ca2+-feedback to individual CaV and NaV targets by interacting with respective PCI segments, this mechanism furnishes a strategy to engineer synthetic channel modulators. We reasoned that introducing a short interaction motif into the PCI locus may permit inhibition of CaV1 Ca2+-feedback by a novel protein. We chose the well-characterized RxxK motif from SLP-76 for its small size and high-affinity interaction with SH3 domain of Mona (Harkiolaki et al., 2003) (Figure 8A). Co-expression of Mona SH3 with wildtype CaV1.3S demonstrated the persistence of CDI, confirming the suitability of these channels as a ‘blank slate’ to confer synthetic modulation (Figure 8B–C; Figure 8—figure supplement 1A). We replaced a 12-residue segment in the preIQ domain with the RxxK motif, as highlighted in Figure 8A, yielding CaV1.3RxxK engineered channels. As this locus is situated upstream of the IQ domain, this maneuver spares apoCaM prebinding. Under endogenous levels of CaM, CaV1.3RxxK exhibit robust baseline CDI (Figure 8D–E; Figure 8—figure supplement 1B). Co-expression of Mona SH3 with CaV1.3RxxK markedly diminished CDI (Figure 8D–E; Figure 8—figure supplement 1B) , thus revealing engineered CDI suppression. These findings illustrate the versatility of the CI module as a regulatory hub and highlight the feasibility of developing synthetic modulators to tune Ca2+-feedback of ion channels. Engineering synthetic modulation of CaV1 channels. (A) Left, schematic shows the atomic structure of Mona SH3 domain in complex with RxxK motif. Right, sequence alignment outlines strategy for insertion of RxxK motif into CaV1.3, yielding CaV1.3RxxK to confer synthetic suppression of CaV1.3 CDI by Mona SH3. (B–C) CaV1.3S expressed with and without Mona SH3 shows full CDI, confirming that wildtype CaV1.3 CDI is insensitive to Mona SH3. Format as in Figure 1A–B. Control data are reproduced from Figure 1D for comparison. (D–E) Mona SH3 strongly diminishes CDI of CaV1.3RxxK. Format as in Figure 1A–B. (F) Cartoon summarizes selective modulation of Ca2+/CaM signaling to CaV1, and NaV1 channels with CaM, stac, and fhf. CaM is a dynamic regulator of CaV1, CaV2, and NaV1, affording millisecond-precision Ca2+-feedback of channel activity. Our findings suggest that distinct auxiliary regulatory proteins tune CaM signaling to individual targets selectively. Stac prevents CaM signaling to CaV1, while fhf reduces signaling to NaV1 (Figure 8F). Parallel analysis of the two proteins delineates mechanisms and sets the stage for in-depth physiological analysis. Stac regulation of CaV1 modifies multiple aspects of CaV1 function. For CaV1.1, stac3 enhances plasmalemmal trafficking (Linsley et al., 2017b; Niu et al., 2018; Polster et al., 2015; Wong King Yuen et al., 2017; Wu et al., 2018), and promotes conformational coupling to RyR (Linsley et al., 2017a; Polster et al., 2016). For CaV1.2, however, stac1-3 isoforms slow inactivation (Campiglio et al., 2018; Polster et al., 2015; Wong King Yuen et al., 2017). Our work generalizes the latter effect to the CaV1 family and further identifies a change in baseline channel openings (PO). A few mechanistic nuances merit attention. First, stac binds to multiple CaV1 segments including (1) the II-III linker (Polster et al., 2018; Wong King Yuen et al., 2017), (2) the III-IV linker (Figure 2D), and (3) the carboxy-tail (Figure 2D) (Campiglio et al., 2018; Niu et al., 2018). Previous studies have shown that stac interaction with the II-III linker is important for CaV1 trafficking in skeletal muscle (Polster et al., 2018; Wong King Yuen et al., 2017). Chimeric analysis here suggests that stac interaction with the carboxy-tail is critical for tuning CDI. Prior analysis of CaV1.2 triadic localization in myotubes suggested that the channel IQ domain may be important for stac binding (Campiglio et al., 2018). However, FRET 2-hybrid assay indicates that stac interaction with the IQ is around tenfold weaker than with the PCI segment. Second, prior work also suggested that stac-mediated reduction in CDI results from competitive displacement of CaM by stac (Campiglio et al., 2018). Functional experiments using CaV1 tethered to CaM, however, suggest that stac does not compete with CaM. Consistent with this scheme, FRET 2-hybrid analysis shows that CaM binding with the CI module is intact even in the presence of stac. Third, key domains within stac relevant for CaV modulation remain controversial. Previous studies have identified the dual SH3 and C1 domains to be critical for stac effect on trafficking and coupling to RyR (Campiglio and Flucher, 2017; Linsley et al., 2017a; Linsley et al., 2017b; Polster et al., 2016), while the C1 has been proposed to be critical for modifying CaV1 CDI (Campiglio et al., 2018; Wong King Yuen et al., 2017). Our findings instead suggest that the U-domain in the stac2 linker region is sufficient to fully recapitulate reduction in CaV1 CDI. Notably, prior analysis of the C1 domain also included this linker (Wong King Yuen et al., 2017). Given these experimental findings, a simple possibility is that distinct subdomains within stac interact with disparate channel segments to support multifunctionality of stac. While the U-domain modifies channel inactivation, other subdomains may support plasmalemmal trafficking and conformational coupling. 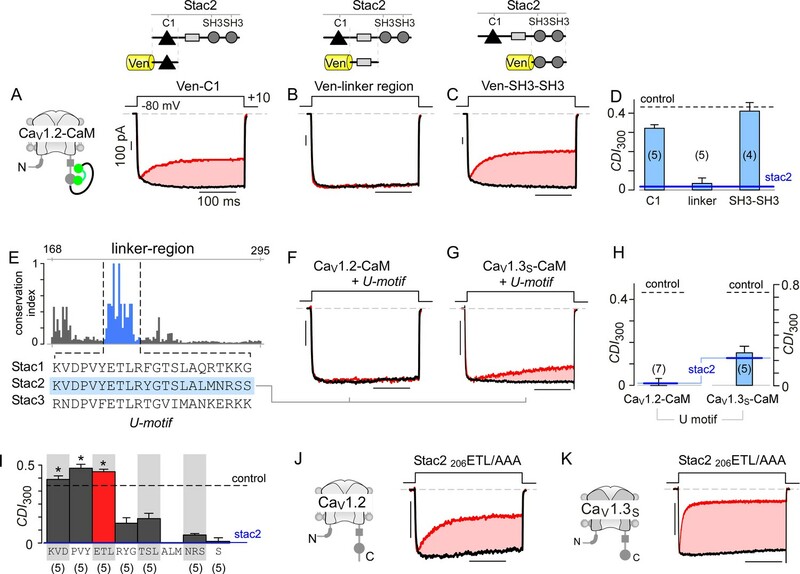 Although functionally divergent, CaV1, CaV2, and NaV1 feature a modular CI element with a common CaM interaction fingerprint and subsequently, shared mechanistic basis for Ca2+-regulation. 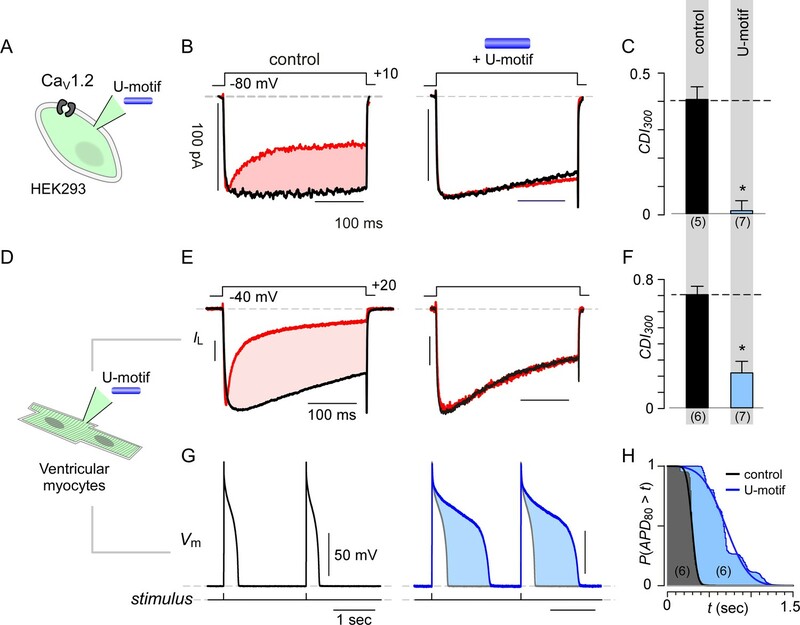 For all three families, apoCaM prebinds the CI module while Ca2+/CaM interaction switches channels between discrete high and low PO gating modes (Ben-Johny et al., 2015). How do allosteric regulators override CaM-signaling? First, stac and fhf use unique interfaces on the channel CI to selectively tune Ca2+-feedback. Second, stac locks CaV1 into a high PO gating mode irrespective of whether apoCaM or Ca2+/CaM is bound, effectively disengaging the pore from CaM-conformational changes. 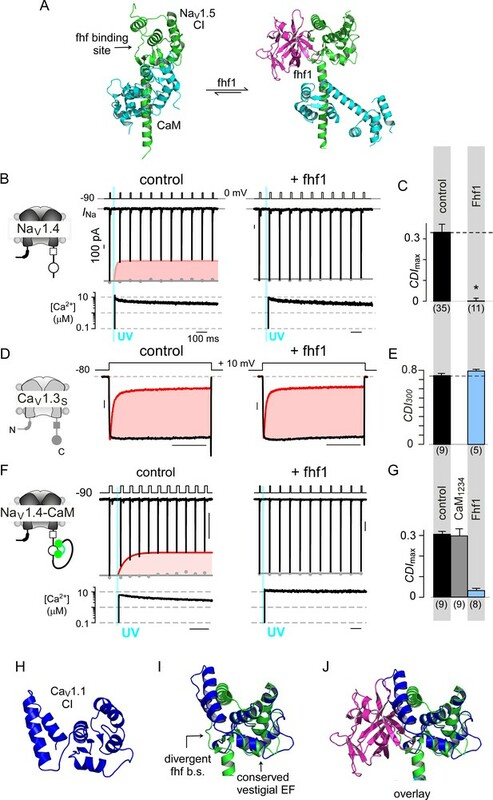 For NaV1, despite fhf binding, CaM undergoes a profound Ca2+-dependent rearrangement (Wang et al., 2012; Wang et al., 2014) suggesting that fhf does not prevent Ca2+ binding to CaM or Ca2+/CaM interaction with effector interfaces. Instead, like stac and CaV1, fhf may override CaM-dependent changes to NaV, akin to a clutch disengaging power transmission in mechanical systems. As fhf elicits a change in apoCaM conformation (Figure 7A) (Gabelli et al., 2014; Wang et al., 2012), baseline gating of NaV may also be altered (Goldfarb et al., 2007; Lou et al., 2005). This parallelism between stac and fhf hints at a shared mechanism. Ca2+-binding proteins (CaBPs) (Haeseleer et al., 2000) also suppress CaM signaling to CaV1 (Lee et al., 2002; Yang et al., 2006). Mechanistically, CaBPs exploit a mixed allosteric scheme – at low concentrations, they engage distinct interfaces from CaM but at higher concentrations displace CaM (Findeisen and Minor, 2010; Oz et al., 2013; Yang et al., 2014). The existence of other regulatory proteins that curtail Ca2+-feedback points to a general class of auxiliary regulators of CaM-signaling to targets beyond NaV1 and CaV1. Identifying such molecular players is critical to understand how CaM signaling is orchestrated. Stac1/2 isoforms are widely expressed in multiple brain regions, including both the hippocampus and the midbrain (Nelson et al., 2013; Suzuki et al., 1996). Our experiments hint at low basal stac2 expression in guinea pig ventricular cardiac myocytes, although previous studies have failed to detect stac2 in murine heart (Nelson et al., 2013). Further quantitative analysis will help establish ambient stac levels including species-specific differences and potential modulatory effects on cardiac function. Interestingly, endogenous CaV1 in both hippocampal and midbrain neurons (Bazzazi et al., 2013; Oliveria et al., 2012) as well as ventricular cardiac myocytes exhibit CDI. As all stac variants shunted CDI of CaV1 in HEK293, it is possible that stac function may be tightly regulated in native settings. One possibility is that stac abundance may be tuned developmentally (Suzuki et al., 1996), pathologically, or via interacting proteins (Satoh et al., 2006). For instance, the transcription factor, NFAT binds to an upstream promoter region of stac2 gene to upregulate stac2 expression in osteoclasts as well as during hypoxic conditions in neural stem cells (Jeong et al., 2018; Moreno et al., 2015). Physiologically, as CaV1 CDI is a potent homeostatic mechanism that prevents pathological Ca2+-overload (Dunlap, 2007), a low concentration regime of stac may be advantageous. By modulating a subpopulation of CaV1, stac may circumvent homeostatic requirements to amplify local Ca2+-signals via sustained Ca2+ influx. The C1 and SH3 domains may serve as scaffolds to localize stac to specific signaling complexes (Campiglio and Flucher, 2017; Cohen et al., 1995; Colon-Gonzalez and Kazanietz, 2006). It is also possible that phosphorylation of stac may dynamically tune its function (Huttlin et al., 2010). Resolving these complexities may unveil mechanisms that tune CaV function spatially and temporally. In cardiac myocytes, CDI of CaV1 is a key factor for action potential duration (Limpitikul et al., 2014; Mahajan et al., 2008). Experimentally, this importance is inferred from prolongation of action potentials upon expression of mutant CaM1234 (Alseikhan et al., 2002). Yet, constitutive CaM expression may yield nonspecific effects (Hall et al., 2013; Wang et al., 2007) that obscure the net contribution of CaV1 CDI (Zhang et al., 2015). Acute elevation of the U-domain bypasses these ambiguities and confirms a key role for CaV1 CDI for cardiac action potentials. Pathophysiologically, differential expression of stac2 has been reported in right ventricular heart failure, hinting at a potential role in calcium remodeling during heart failure (di Salvo et al., 2015). Post-transcriptional modification of CaV1.3 generates an assortment of variants with modified carboxy-termini (Bock et al., 2011; Huang et al., 2012). The apoCaM affinities of these variants are such that CaM fluctuations may redistribute channels between populations lacking or endowed with apoCaM (Bazzazi et al., 2013), evoking concomitant changes in maximal PO and CDI of CaV1.3 (Adams et al., 2014). Stac uniformly locks these variants into a high PO configuration incapable of CDI, thereby supporting reliable and persistent Ca2+-influx in spite of CaM. Notably, functional effects of CaV1.3 alternative splicing have been shown to be cell-type specific suggesting that auxiliary regulators may tune channel properties (Scharinger et al., 2015). Fitting with these regulatory possibilities, disruption of stac modulation of CaV1.3 in Drosophila alters circadian rhythm (Hsu et al., 2018). Unlike canonical fibroblast growth factors, fhf lack a secretory signal sequence (Smallwood et al., 1996) and serve as intracellular proteins (Schoorlemmer and Goldfarb, 2001). Four distinct fhf isoforms have been identified with tissue-specific expression in neurons, cardiomyocytes, and skeletal muscle (Goldfarb, 2005; Kraner et al., 2012; Smallwood et al., 1996). Functionally, fhf isoforms promote NaV1 trafficking and fast inactivation (Pablo and Pitt, 2016). More specifically, fhf adjust steady-state voltage-dependence of inactivation (Lou et al., 2005), elicit a kinetically distinct long-term inactivation (Dover et al., 2010), and modify resurgent current (Yan et al., 2014). Our present findings suggest that fhf1 also tunes CDI of NaV1. Physiologically, NaV CDI may be prominent during repetitive activity, as excess Ca2+ accumulation may inhibit Na currents. Thus, suppression of NaV1 CDI by fhf may enhance repetitive firing. Interestingly, loss of fhf1 and/or fhf4 result in diminished firing properties of cerebellar Purkinje neurons (Bosch et al., 2015; Goldfarb et al., 2007), while loss of fhf2 reduces cardiac conduction (Park et al., 2016; Wang et al., 2011a). It is possible that loss of fhf may enhance net CDI thus contributing to diminished excitability in these cells. As mutations in fhf1 are associated with epileptic encephalopathy (For CENetDDD Study group‡* et al., 2016) and cardiac conduction disorders (Hennessey et al., 2013) while mutations in fhf4 are linked to spinocerebellar ataxia (Brusse et al., 2006), resolving the dynamic interplay between CaM and fhf in tuning NaV1 may be critical for understanding pathogenic mechanisms. Finally, our results highlight the possibility of engineering synthetic regulation to tune CaM signaling. While CaV1.3 is insensitive to Mona SH3, insertion of an RxxK motif (Harkiolaki et al., 2003) into the carboxy-tail preIQ segment allows latent modulation by Mona SH3. Given the structural similarity of the CI modules of CaV1, CaV2, and NaV1, and sequence variability within the preIQ domain, emerging protein engineering methods may be used to screen for synthetic modulators of related ion channel families. 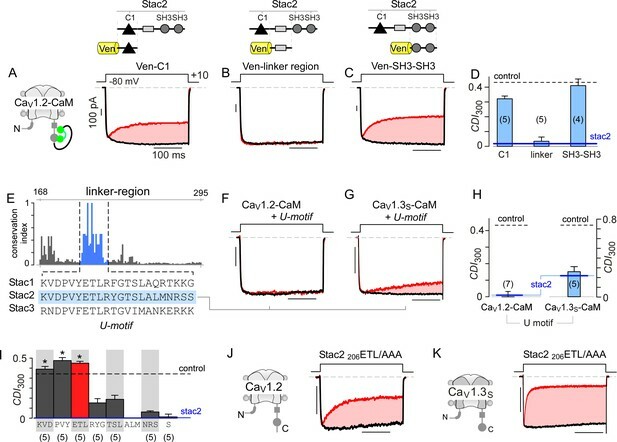 As the ligand specificity of SH3 domains can be custom-engineered (Nguyen et al., 2000) and subcellular localization tuned via targeting motifs (Komatsu et al., 2010), a custom library of synthetic regulators may be developed to combinatorially modify kinetic properties of CaV1, CaV2, or NaV1 channels with spatiotemporal specificity. Generalizing this approach may lead to the development of new tools to manipulate Ca2+ signaling. In all, our findings unravel the elegant interplay between a novel class of allosteric regulators and CaM in orchestrating the activity of CaV and NaV channels. Gene (human) CaV1.443* PMID: 22069316 Laboratory of Dr.
Gene (human) fhf PMID: 8790420 Laboratory of Dr.
CaV1.2, CaV1.3, CaV1.443*, CaV2.1, CaV2.2, CaV2.3, and NaV1.4 variants were unmodified from previously published constructs: CaV1.2 (NM001136522) (Wei et al., 1991), CaV1.2-CaMWT (Mori et al., 2004), CaV1.3S (AF370009.1), CaV1.3L engineered from CaV1.3S and human long distal carboxyl tail (NM000718) (Liu et al., 2010), RNA-edited variant CaV1.3MQDY (Bazzazi et al., 2013; Huang et al., 2012), CaV1.443* was gifted from Dr. Soong Tuck Wah (National University of Singapore), CaV2.1 splice variant 37a(EFa) with 43+/44-/47− (Soong et al., 2002) was gifted from Dr. Terry Snutch (University of British Columbia), CaV2.2 (Jones et al., 1999), CaV2.3 (Mori et al., 2008), NaV1.4 (Trimmer et al., 1990). Stac variants were purchased from Origene: human stac1 mRNA transcript 1 (NP003140.1), mouse stac2 (NP666140.1), and human stac3 isoform 2 (NP659501.1). U-peptide was synthesized by Genscript (KVDPVYETLRYGTSLALMNRSS). Fhf variants were gifted from Dr. Gordon Tomaselli and Dr. Jeremy Nathans (Johns Hopkins University). For whole-cell electrophysiology, single-channel electrophysiology, and immunohistochemistry, HEK293 cells (ATCC; mycoplasma tested negative) were cultured on glass coverslips in 10 cm dishes and transfected by a calcium phosphate method (Peterson et al., 1999) with the following amounts of DNA: 3 µg of SV40 T antigen to enhance expression, 2–8 µg of α1-subunit of Ca2+ or Na+ channel depending on expression, 8 µg from rat β2A (Perez-Reyes et al., 1992) (M80545), 8 µg from rat α2δ (Tomlinson et al., 1993) (NM012919.2), and 8 µg of the stac1, stac2, or stac3 variants indicated. For FRET two-hybrid experiments, cells were cultured on glass-bottom dishes and transfected with a standard polyethylenimine protocol (Lambert et al., 1996). Epifluorescence measurements were recorded 1–2 days after transfection. Adult guinea pig ventricular myocytes (aGPVMs) were isolated from whole hearts of Hartley strain guinea pigs 3–4 weeks old (250–350 g). Guinea pigs were anesthetized via intraperitoneal injection with pentobarbital (35 mg/kg). Hearts were then excised, and single ventricular myocytes were isolated following a previously published protocol (Joshi-Mukherjee et al., 2013). Cells were plated on glass coverslips that were laminin (20 µg/mL) coated overnight at 4°C. Immunohistochemistry aGPVMs plated on glass coverslips were first washed three times with cold PBS and then fixed in 3.7% paraformaldehyde (15710, Electron Microscopy Sciences) in PBS for 15 min. After washing three times with PBS, cells were permeabilized in cold 0.5% Triton X-100 in tris buffered saline (TBS) for 20 min and then blocked with 10% goat serum in PBS for 1 hr at room temperature. Cells were incubated overnight at 4°C in primary antibodies diluted in antibody diluent solution (IW-1000, IHC World): monoclonal anti-α-actinin (sarcomeric) antibody produced in mouse (1:300, A7811), anti-STAC (stac1) antibody [EPR12805]-N-terminal (1:100, ab181157) or anti-STAC2 (stac2) antibody-N-terminal (1:100, ab156080) produced in rabbit. Next day, cells were rinsed three times with 0.05% TWEEN20 (Sigma P9416) in TBS (TBS-T) for 5 min each. In the dark, cells were incubated with secondary antibodies (1:1000): goat anti-mouse IgG1 Alexa Fluor 488 (1:1000, A21121), goat anti-rabbit IgG Alexa Fluor 594 (1:1000), and DAPI (1:10000) diluted in antibody solution for 45 min at room temperature and then washed three times with TBS-T for 5 min each. Stained cells were mounted with prolong gold mounting media (Invitrogen) on a microscope slide (Fischer Scientific). Transfected HEK293 were immunostained following a similar protocol to that of aGPVM, but were not labelled with sarcomeric primary antibody and its respective secondary antibody. Western blot aGPVMs and HEK293 cells were washed twice with PBS buffer. Cells were harvested with 1 mL 1x RIPA buffer (20–188, Sigma Aldrich) containing half a tablet of complete mini-EDTA-free protease inhibitor (11836170001, Sigma Aldrich) and incubated at 4°C for 30 min. Samples were centrifuged at 15,000 RPM for 15 min, and the pellet was discarded. Then, 2–5 µg of proteins in the supernatant were heated at 37°C for 30 min with 2x Laemmli sample buffer (S3401, Sigma Aldrich). Samples were loaded into 4–12% gradient gel (NP0335BOX, Invitrogen) with PageRuler plus prestained protein ladder (26619, Invitrogen) and run at 100 V for 2 hr at room temperature in running buffer: 1x NuPAGE MOPS SDS running buffer: 50 mM MOPS, 50 mM Tris base, 0.1% SDS, 1 mM EDTA, pH to 7.7. Proteins were transferred on ice from the gel to nitrocellulose membrane (10600003, GE Healthcare Life science) for 75 min at 10 V in transfer buffer: 24 mM Tris base, 192 mM glycine, 20% v/v methanol. Membrane was blocked with 5% (w/v) Blotting-Grade-Blocker (1706404, Bio-Rad) in 1x TRIS-buffered saline for 1 hr at 4°C. Primary antibody for stac2 (1:250) was added to the blocking buffer with 0.1% (v/v) Tween 20 (1706404, Bio-Rad) and incubated overnight at 4°C. Next day, the membrane was washed three times for 5 min each with TBS with 0.1% (v/v) Tween 20 (TBS-T). The secondary antibody (111-035-144, Jackson ImmunoResearch; 1:10,000) was added to the blocking buffer with 0.1% (v/v) Tween 20 and incubated for 1 hr. The membrane was washed again three times for 5 min each with TBS-T. Finally, western blots were developed with SuperSignal West Pico Chemiluminescent Substrate (34580, ThermoFischer) and images were collected on an Alpha InnoTech FluorChem HD2 imaging system. Images of immunostained tissue slices and cells were captured with either an Olympus Fluorview FV300 confocal laser scanning microscope or an LSM780 (Carl Zeiss, Oberkochen, Germany) confocal microscope. For the FV300, we used Fluoview software (Olympus) with a PlanApo 403 or 603 oil objective (NA 1.40, PLAPO60XO3; Olympus). Argon laser (488 nm) was used to excite Alexa Fluor 488 (green), and Helium Neon (HeNe) Green Laser was used to excite Alexa Fluor 594 (red). Olympus optical filters used were 442/515 nm excitation splitter (FV-FCV), 570 nm emission splitter (FV-570CH), BA510 IF and BA530RIF for green emission channel, and 605 BP ﬁlter for red channel. Images were processed in ImageJ. Similar settings were used for the LSM780 setup. Whole-cell voltage-clamp recordings for HEK293 were collected at room temperature 1–2 days after transfection with Axopatch 200A (Axon Instruments). Glass pipettes (BF150-86-10, Sutter Instruments) were pulled with a horizontal puller (P-97; Sutter Instruments Company) and fire polished (Microforge, Narishige, Tokyo, Japan) to have 1–3 MΩ resistance. Recordings were low-pass filtered at 2 kHz and sampled at 10 kHz with P/8 leak subtraction and 70% series resistance and capacitance compensation. For recordings of CaV1.2 (Figure 1A–B, Figure 5I–K, Figure 6B), CaV1.3S (Figure 1C–D, Figure 3—figure supplement 1A–B and and G, Figure 7D–E, and Figure 8B–C), CaV1.443* (Figure 1E–F), CaV2.2 (Figure 1I–J), CaV2.3/1.3 CI chimera (Figure 2E–F), CaV1.3-CaM (Figure 3A–B, Figure 3—figure supplement 1C–F, and Figure 5G–H), CaV1.2-CaM (Figure 2C–D, Figure 5A–F) and CaV1.3RxxK (Figure 8D–E) exogenously expressed in HEK293 cells, the internal solution contained (in mM): CsMeSO3, 114; CsCl2, 5; MgCl2, 1; MgATP, 4; HEPES, 10; BAPTA, 10; adjusted to 295 mOsm with CsMeSO3 and pH 7.4 with CsOH. The external solution contained (in mM): TEA-MeSO3, 140; HEPES, 10; CaCl2, or BaCl2 40; adjusted to 300 mOsm with TEA-MeSO3 and pH 7.4 with TEA-OH. For recordings of CaV2.1 (Figure 1G–H) and CaV2.3 (Figure 1K–L), the internal solution contained (in mM): CsMeSO3, 135; CsCl2, 5; MgCl2, 1; MgATP, 4; HEPES, 10; EGTA, 1; adjusted to 295 mOsm with CsMeSO3 and pH 7.4 with CsOH. The external solution contained (in mM): TEA-MeSO3, 140; HEPES, 10; CaCl2, or BaCl2 5; adjusted to 300 mOsm with TEA-MeSO3 and pH 7.4 with TEA-OH. At a holding potential of −80 mV, we used a family of test pulses from −30 mV to +50 mV with repetition intervals of 20 s. Custom MATLAB (Mathworks) software (https://github.com/manubenjohny/WCDTY; copy archived at https://github.com/elifesciences-publications/WCDTY) was used to determine peak current and fraction of peak current remaining after either 300 ms (r300) or 800 ms (r800) of depolarization. We incubated aGPVMs for 20–48 hr after isolation in 5 µM ryanodine for 5–10 min before we collected whole-cell recordings. The internal recording solution contained (in mM) CsMeSO3, 114; CsCl2, 5; MgCl2, 1; MgATP, 4; HEPES, 10; BAPTA, 10; ryanodine, 0.005 adjusted to 295 mOsm with CsMeSO3 and pH 7.4 with CsOH. Cells were sealed in Tyrodes solution, which contained (in mM): NaCl, 135; KCl, 5.4; CaCl2, 1.8; MgCl2, 0.33; NaH2PO4, 0.33; HEPES, 5; glucose, 5 (pH 7.4). For CDI measurements, external solutions containing (in mM): TEA-MeSO3, 140; HEPES, 10; CaCl2, or BaCl2 40; adjusted to 300 mOsm with TEA-MeSO3 and pH 7.4 with TEA-OH were perfused. Welch’s T-test was used to verify statistical significance among the population data. For CDI recordings, we determined required sample size based on power analysis. Based on historical estimates of normal variation in CDI/CDF measurements, we computed the sample size required such that type I and type II errors are 5% to be 3.5. Thus, we obtained at least four independent measurements for all electrophysiological experiments. Current-clamp recordings of aGPVMs were performed on the same setup and were filtered at 5 kHz and sampled at 25 kHz. The internal solution contained (in mM): K glutamate, 130; KCl, 9; NaCl, 10; MgCl2, 0.5; EGTA, 0.5, MgATP, 4; HEPES, 10; adjusted to pH 7.3 with KOH. The external solution contained (in mM): NaCl, 135; KCl, 5.4; CaCl2, 1.8; MgCl2, 0.33; NaH2PO4, 0.33; HEPES, 5; glucose, 5 (pH 7.4). The time from upstroke to 80% repolarization (APD80) was measured with MATLAB (Mathworks) and used as a metric for comparing physiological output between peptide treated and untreated. For experiments with U-peptide, peptide was dissolved in ddH2O to 2 mg/mL and then diluted to 500 μM in the appropriate internal solution. i(V)=−g⋅(V−VS)⋅exp(−(V−VS)⋅z⋅F/(R⋅T)) / (1−exp(−(V−VS)⋅z⋅F/(R⋅T))) where g is the single-channel conductance (~0.2 pA/mV), z is the apparent valence of permeation (~2.1), F is Faraday’s constant, R is the gas constant, and T is the temperature in degrees Kelvin (assumed room temperature). These parameters were held constant for all patches, except for slight variations in the voltage-shift parameter Vs ~ 35 mV, as detailed below. (3) All leak-subtracted traces for each patch were averaged (and divided by the number of channels in the patch) to yield an I–V relation for that patch. As slight variability in VS was observed among patches, we calculated an average VS for each construct, VS,AVE. The data from each patch were then shifted slightly in voltage by an amount ΔV = VS,AVE – VS, with ΔV typically about ±5 mV. This maneuver allowed all patches for a given construct to share a common open-channel GHK relation. Thus shifted, the I–V relations obtained from different patches for each condition/construct were then averaged together. (4) PO at each voltage was determined by dividing the average I (determined in step three above) into the open-channel GHK relation. Channel number was determined by the maximal number of overlapping opening events upon application of the channel agonist Bay K8644 (5 μM) at the end of each recording. For modal analysis, a dashed line discriminator was chosen to be the average single-trial PO = 0.075 such that traces with average single-trial PO >0.075 were categorized as high PO while the remaining traces were considered to be low PO. All Ca2+-uncaging experiments were conducted on a Nikon TE2000 inverted microscope with a Plan Fluor Apo 40 × oil objective as previously described (Ben-Johny et al., 2014). Briefly, a classic Cairn UV flash photolysis system was used for Ca2+-uncaging with brief UV pulses of ~1.5 ms in duration powered by a capacitor bank of up to 4000 μF charged to 200–290V. For concurrent Ca2+ imaging, Fluo4FF and Alexa568 dyes were dialyzed via patch pipette and imaged using Argon laser excitation (514 nm). Background fluorescence for each cell was measured prior to pipette dialysis of dyes and subtracted subsequently. A field-stop aperture was used to isolate fluorescence from individual cells. Dual-color fluorescence emission was attained using a 545DCLP dichroic mirror, paired with a 545/40 BP filter for detecting Fluo4FF, and a 580LP filter for detecting Alexa568. Typically, uncaging experiments were conducted after ~2 min of dialysis of internal solution. Welch’s T-test was used to verify statistical significance between the population data. For all Ca2+-uncaging experiments, the internal solution contained (in mM): CsMeSO3, 120; CsCl, 5; HEPES (pH 7.4 with CsOH), 10; Fluo-4FF pentapotassium salt (Invitrogen), 0.01; Alexa 568 succinimidyl ester (Invitrogen), 0.0025; Citrate, 1; DM-Nitrophen EDTA (DMN) and CaCl2 were adjusted to obtain the desired Ca2+ flash. Typically, for flashes in the range 0.5–2 μM, DMN, 1 mM; and CaCl2, 0.7 mM. For the 2–8 μM range, DMN, 2 mM; and CaCl2, 1.4 mM. For larger Ca2+ steps, DMN, 4 mM; and CaCl2, 3.2 mM. As DMN can bind Mg2+, all experiments were conducted with 0 mM Mg2+ internally. For all Na channel experiments, the bath solution contained (in mM): TEA-MeSO3, 45; HEPES (pH 7.4), 10; NaCl, 100; at 300 mOsm, adjusted with TEA-MeSO3. To collect a range of donor molecule (Dfree) concentrations, HEK293 cells were transfected with combinations of DNA ratios. Cells were immersed in 2 mM Ca2+ Tyrodes solution, which contained (in mM): NaCl, 138; KCl, 4; CaCl2, 2; MgCl2, 1; HEPES, 10; glucose, 10. Three-cube FRET fluorescence measurements were performed under resting Ca2+ concentrations on an inverted fluorescence microscope. FRET efficiency (EA and ED) was calculated for each cell (Erickson et al., 2001) and a binding curve, either EA = [Dfree]/(Kd,EFF + [Dfree]) · EA,max or ED = [Afree]/(Kd,EFF + [Afree]), was fit to compute the effective dissociation constant (Kd,EFF). The Journal of Biological Chemistry 286:42736–42748. European Journal of Paediatric Neurology 18:413–415. Biochimica Et Biophysica Acta (BBA) - Molecular and Cell Biology of Lipids 1761:827–837. Journal of Cardiac Failure 21:398–411. The Journal of Physiology 588:3695–3711. The Journal of General Physiology 129:379–383. Cytokine & Growth Factor Reviews 16:215–220. Journal of Biological Chemistry 275:1247–1260. Chronobiology International, 35, 10.1080/07420528.2018.1454937, 29621409. Cell Death & Differentiation 25:1364–1374. Journal of Molecular and Cellular Cardiology 65:76–87. Molecular and Cellular Neuroscience 7:239–246. The Journal of Neuroscience : The Official Journal of the Society for Neuroscience 20:6830–6838. The Journal of Physiology 593:2753–2778. Journal of Molecular and Cellular Cardiology 74:115–124. Advances in Second Messenger and Phosphoprotein Research 30:89–151. The Journal of Physiology 569:179–193. Journal of Molecular and Cellular Cardiology 34:919–939. Biochemical and Biophysical Research Communications 460:5–21. The Journal of General Physiology 150:jgp.201812005. The Journal of Biological Chemistry 288:12680–12691. The Neuroscientist : A Review Journal Bringing Neurobiology, Neurology and Psychiatry 22:19–25. The Journal of Biological Chemistry 267:1792–1797. Trends in Cardiovascular Medicine 12:32–37. The Journal of General Physiology 150:jgp.201711917. Annual Review of Physiology 64:289–311. Journal of Neuroscience Methods 152:278–288. The Journal of Biological Chemistry 283:20733–20744. The Journal of Neuroscience : The Official Journal of the Society for Neuroscience 22:10142–10152. Pflügers Archiv - European Journal of Physiology 460:361–374. Biochemical and Biophysical Research Communications 229:902–909. The Journal of Biological Chemistry 286:42725–42735. The Journal of Biological Chemistry 287:832–847. Cold Spring Harbor Protocols, 2016, 10.1101/pdb.prot087213, 27587775. Journal of Biological Chemistry 286:24253–24263. The Journal of Biological Chemistry 266:21943–21947. Trends in Cardiovascular Medicine 21:199–203. The Journal of General Physiology pp. 475–489. Nature Reviews Drug Discovery 15:19–34. Progress in Biophysics and Molecular Biology 98:120–136. Thank you for submitting your article "Allosteric regulators selectively shunt Ca2+-feedback of CaV and NaV channels" for consideration by eLife. Your article has been reviewed by three peer reviewers, and the evaluation has been overseen by a Reviewing Editor and Richard Aldrich as the Senior Editor. The following individuals involved in review of your submission have agreed to reveal their identity: Bruce P Bean (Reviewer #2); Dejian Ren (Reviewer #3). This study describes two classes of proteins, stac and fhf, interfere with CaM binding to voltage-dependent Ca and Na channels, both of which have a CaM binding domain that stacs and fhfs can also bind, thereby reducing Ca-dependent inactivation. The data offer a potential explanation for why CaM can have targeted effects, and reveal interactions among channel modulators that have posed long-standing puzzles, e.g. why CaM sometimes has effects on channels with CaM binding domains but sometimes not. 1) The primary results on how stac modulates Ca channels are all with overexpression. Consequently, it is unclear to what extent normal expression levels participate in regulation of currents and what the nature of the competition (or not) with CaM is. Additional approaches to clarify these points are suggested by the reviewers. 2) The immunostaining in Figure 1 of stac expression in cardiac neurons is not convincing. The reviewers suggest either removal of these data or a more extensive validation of the antibodies and/or other means of verifying the signal. 3) A number of discrepancies with the published literature were noted. These should be acknowledged and discussed, and where possible, resolutions proposed. 4) The caliber of the data is high but the highly dramatic, hyperbolic language detracts from the overall quality of the manuscript. While some stylistic freedom is appropriate, it must not interfere with accuracy and readability. A few specific sentences are noted in the reviews, but the full manuscript should be revised substantially with this idea in mind. The basis for these comments, in the reviewers' words, is included below, under "Major Comments" to facilitate the revision. Title: It is not clear that the prevention of CaM modulation of channels by stac is meaningfully described by the word "shunt." Possibly a more straightforward work like "prevent" or "interferes with" would be more appropriate. 1) Interpretations from overexpression. A general issue concerning the significance is that the key results in how stac proteins modify behavior of calcium channels are all with overexpression of stac, and there is no evidence that there is any "tuning" from this mechanism physiologically (in stark contrast to previous data with stac3 in skeletal muscle, where the physiological relevance is quite clear). Previous studies in both heart and neurons show prominent calcium-dependent inactivation, giving little reason to think that stac inhibition of this effect is important. The author's experiments here disrupting the interaction also suggest little or no physiological significance in cardiac muscle. An RNAi or knock-out approach would be better suited for testing physiological relevance for native Cav1.2 or Cav1.3 channels. Also, the authors conclude that STAC doesn't compete with CaM to suppress CDI, a mechanism apparently contrast to the "competition-based" mechanism implicated by Campiglio et al., 2018. While the multiple experiments in this manuscript do suggest that the authors' model is more convincing, a major evidence the authors used to "explicitly rule out" that a displacement of CaM binding by STAC is necessary for CDI suppression is by fusing CaM to CaV's C-terminus to increase local CaM concentration (Figure 3F-I). However, such a fusion still can't rule out that overexpressing STAC (as done in the paper) displaces CaM's binding to the site. One way to solve this problem is perhaps by directly monitor CaM binding with and without STAC. An easier, though less direct, experiment is perhaps to overexpress CaM (as done in the single channel recordings in Figure 4) and to test whether STAC still eliminates CDI when CaM binding is presumably saturated. 2) Immunostaining. A potentially novel result is the immuno evidence for stac2 in cardiac muscle. Previous work concluded stac3 is expressed in skeletal muscle and stac1 and stac2 in neurons, with no clear expression of any in cardiac muscle. But here the staining for stac2 is weak and there is no validation of the antibody, so this is very weak evidence -especially since the disruption experiment suggests no basal modulation that might suggest endogenous stac expression. Everyone who has worked with antibodies knows how easy it is to get weak off-target staining. The title of Figure 1 "Stac2 is differentially expressed in cardiac myocytes and neurons" is also somewhat misleading, as the experiments don't examine stac2's expression in neurons and the immunostaining data is not quantitative. 3) Relation to other work. The authors report several interesting findings in this paper. First, they found that all the STACs (STAC1-3) can abolish/reduce the calmodulin (CaM)-mediated CDI of L-type (CaV1 sub-family) CaVs (a finding also recently reported by other groups, e.g. Polster et al., 2015, Campiglio et al., 2018). Second, the authors used the FRET protein-interaction assay and found that STAC3 interacts with the proximal Ca2+-inactivating (PCI) segment of the Ca2+-inactivating (CI) module in the C-terminus of CaV1.3, but not with the other segments, including the IQ motif immediately C-terminal to the PCI and the II/III loop previously found by others to interact with STACs in the CaV1.1 (Yuen et al., 2017, Polster et al., 2018) or CaV1.2 (Campiglio et al., 2018). Intriguingly, the authors found that a short "linker" between the C1 and the SH3 regions on STAC is required for STAC's suppression of CDI, and infusion of a U-motif peptide derived from this linker region is sufficient to remove CDI. This finding again is apparently contrast with a previous conclusion by others that the C1 domain is the major CDI-slowing determinant. Mechanistically, the authors conclude that STACs allosterically control CDI and "lock" the channel into a high opening probability state, a mechanism contrast to a previously proposed one by which STAC competes with CaM. Interestingly, the authors also discovered that the regulation of NaV's CDI by FGF has a structural requirement analogous to that of the regulation of CaVs by STACs. Perhaps the most remarkable finding in the paper is that the authors were able to introduce an artificial Mona SH3-binding sequence in the PCI region to confer complete CDI inhibition by Mona SH3, a protein that doesn't affect the wild-type CaV. Overall, there are many apparent "discrepancies" between the current paper and the two PNAS papers (Yuen et al., 2017, Campiglio et al., 2018), ranging from the STAC binding sites on CaVs (PCI in this paper vs. the IQ motif and II/III loop in the others), and the important segment on STAC (linker vs. C1) to the mechanism (allosteric vs. competitive). The authors might want to elaborate the differences and provide potential explanations. Thank you for resubmitting your work entitled "Allosteric regulators selectively prevent Ca2+-feedback of CaV and NaV channels" for further consideration at eLife. Your revised article has been favorably evaluated by Richard Aldrich (Senior Editor), a Reviewing Editor, and two reviewers. One reviewer (whose comments are included verbatim below) identified some inconsistencies in the match between figure panels cited in the text and in the figures, and also noted that the control plots in the last two supplementary figures (Figure 7—figure supplement 1 and Figure 8—figure supplement 1) appear to be identical, but the duplication (if these are indeed duplicates) is neither justified nor indicated in the legends. The same panel appears to be duplicated in Figure 1—figure supplement 1 and Figure 3—figure supplement 1, although in the latter it is labeled as N=6 instead of N=9 as in the other three panels. These issues raise concern about the care with which the manuscript was assembled and presented. Before a final decision is rendered, please ensure (1) that the correct data and figure panels are present throughout the manuscript, (2) that they are called correctly, (3) that any duplication of panels to facilitate comparison is clearly indicated as such (with appropriate justification for a common control group), and (4) that there are no other related errors. In your revision, please clearly indicate the corrections that have been made. The revision generally addresses the main issues raised on the original version. The data are extensive and comprise a very comprehensive picture of the molecular interactions with the multiple STAC proteins with multiple calcium channels. It is still unproven that the STAC interaction functions physiologically to "tune" Ca-dependent channel inactivation, but the authors make a good point that testing this via RNAi would be technically challenging given current experimental systems and making knock-out mice would be a major project. The fact that STAC proteins are heavily expressed in the brain gives some credence to the idea that they could be functionally important in neurons, or knock-outs. The authors need to proof-read the manuscript more carefully. The reviewer copy was hard to read, as it consisted of a pdf incorporating cross-outs and additions, which made spotting errors difficult. However, it is obvious that not all changes in re-numbering figure references were done correctly (e.g. in the first paragraph of the subsection “Stac selectively suppresses Ca2+-feedback of CaV1 channels”, Figure 2A should now be 1A, and in the second paragraph of the subsection “Stac interacts with CaV1 CI module to elicit CDI suppression”, Figure 3B should be 2B). Also the fact that the figures were not numbered made the reviewing process more difficult than was necessary. Also, at the end of the manuscript there are supplementary figures that are exact duplicates. The basis for these comments, in the reviewers' words, is included below, under "Major Comments" to facilitate the revision. Title: It is not clear that the prevention of CaM modulation of channels by stac is meaningfully described by the word "shunt." Possibly a more straightforward work like "prevent" or "interferes with" would be more appropriate. We thank the reviewers for this suggestion. The revised title replaces the word shunt with prevent. 1) Interpretations from overexpression. A general issue concerning the significance is that the key results in how stac proteins modify behavior of calcium channels are all with over-expression of stac, and there is no evidence that there is any "tuning" from this mechanism physiologically (in stark contrast to previous data with stac3 in skeletal muscle, where the physiological relevance is quite clear). Previous studies in both heart and neurons show prominent calcium-dependent inactivation, giving little reason to think that stac inhibition of this effect is important. The author's experiments here disrupting the interaction also suggest little or no physiological significance in cardiac muscle. An RNAi or knock-out approach would be better suited for testing physiological relevance for native Cav1.2 or Cav1.3 channels. Also, the authors conclude that STAC doesn't compete with CaM to suppress CDI, a mechanism apparently contrast to the "competition-based" mechanism implicated by Campiglio et al., 2018. While the multiple experiments in this manuscript do suggest that the authors' model is more convincing, a major evidence the authors used to "explicitly rule out" that a displacement of CaM binding by STAC is necessary for CDI suppression is by fusing CaM to CaV's C-terminus to increase local CaM concentration (Figure 3F-I). However, such a fusion still can't rule out that over-expressing STAC (as done in the paper) displaces CaM's binding to the site. One way to solve this problem is perhaps by directly monitor CaM binding with and without STAC. An easier, though less direct, experiment is perhaps to over-express CaM (as done in the single channel recordings in Figure 4) and to test whether STAC still eliminates CDI when CaM binding is presumably saturated. We agree with the reviewers that mammalian knockout models of stac1 and stac2 would be powerful approaches to dissect the contribution of this modulatory mechanism to cardiac and neuronal function. However, to the best of our knowledge, there are no such models currently available and generation of one would be outside the scope of the present manuscript. For cardiac myocytes, two complexities further obscure analysis of stac modulation of CaV channels. First, the primary consequence of a reduction in Ca2+ channel inactivation is a prolongation of the phase 2 of the action potential. However, as mice exhibit minimal phase 2, murine models can be limiting in studying consequences of deficits in CaV inactivation. We chose freshly dissociated guinea pig models for pipette dialysis of U-motif peptides for this reason. Second, cultures of cardiac myocytes from guinea pig (and other organisms) de-differentiate within 24-48 hrs, resulting in marked changes in gene expression and a loss of channel modulation (e.g. β-adrenergic effect). This short time-window limits the practicality of approaches such as RNAi suppression. Given these limitations, we believe that the suggested experiments would be an exciting follow up study. Instead, we here focus on establishing a unified mechanistic framework for stac modulation of CaV channels and, in so doing, set the stage for subsequent in depth physiological analysis. To ascertain stac levels necessary for physiological modulation, we undertook a live-cell FRET 2-hybrid assay to estimate holo-channel affinity for stac. We co-expressed YFP-tagged CaV1.3 with CFP-tagged stac3 and measured FRET efficiencies from individual cells. Thus probed, we obtained an effective holochannel affinity of Kd,EFF = 1458 ± 251 Dfree units ~ 47 nM. By comparison, similar holochannel analysis of CaM binding revealed Kd,EFF = 700 Dfree units ~ 22 nM (Yang et al., 2014). Given this nanomolar affinity estimate, our expectation is that even low concentrations of stac would suffice to elicit functional modulation. Moreover, small changes in CaV1 CDI elicits marked changes in cardiac action potential waveform suggesting that low levels of stac may be functionally important. These findings are shown in Figure 2. In skeletal muscle where endogenous stac is very high (~ μM range), the vast majority of channels would already be stac-bound and therefore insensitive to any fluctuations. By contrast, if ambient stac levels were in the nanomolar range, then even small fluctuations would tune baseline PO and CDI. Recent work shows that the transcription factor NFAT binds to an upstream promoter region of stac2 gene and upregulates stac2 expression in osteoclasts (Jeong et al., 2018) and during hypoxic conditions in neural stem cells (Moreno et al., 2015). As NFAT signaling is upregulated during pathological cardiac hypertrophy, such conditions may also enhance stac expression. The reviewers further raise an important concern regarding the nature of interplay between stac and CaM in modulating CaV1. Though experiments using tethered CaM demonstrates that stac is capable of inhibiting CDI despite the overwhelming local concentration, it is possible that stac may yet displace CaM from its interaction site. To address this concern, we used FRET 2-hybrid assay to monitor CaM binding to its primary interface for CaV1.3, the CI domain, both in the presence and absence of stac. Figure 3 shows robust baseline interaction of CFP-tagged CaM to YFP-tagged CaV1.3 CI with a relative dissociation constant, Kd,EFF ~ 4000 ± 291 Dfree units. If stac competes with CaM for a common interface, then the relative affinity would be reduced yielding a larger value for Kd,EFF. Indeed, co-expression of untagged CaM1234 with aforementioned FRET pairs resulted in ~11-fold reduction in apparent affinity, with Kd,EFF = 47153 ± 4815 Dfree units. By contrast, co-expression of untagged-stac3 did not appreciably perturb CI-CaM interaction with Kd,EFF = 4182 ± 330. These results demonstrate that stac does not displace CaM from its binding interface. These results have been added to Figure 3. In addition to the FRET experiments, we also co-expressed CaV1.3S with both CaM and stac2 as suggested by the reviewers. This maneuver also showed a reduction in CDI confirming that stac eliminates CDI even when CaM binding is saturated. The data is shown in Figure 3—figure supplement 2G. We thank the reviewers for this suggestion. To assess our ability to identify stac2 in immunostaining experiments, we undertook quantitative analysis of fluorescence intensities from confocal images of individual HEK293 cells expressing recombinant stac1-3 isoforms and probed via stac1 (top row) and stac2 (bottom row) antibodies. Black line in Figure 6—figure supplement 1B shows the distribution of fluorescence intensities from ~ 80 untransfected cells probed using anti-stac1 (top) with mean fluorescence intensities of F- = 218 ± 1.85 (s.e.m) a.u. HEK293 cells expressing recombinant stac1 when probed with anti-stac1 revealed a population of cells with enhanced fluorescence intensity with mean F- = 507 ± 77.63 (s.e.m) a.u. By comparison, fluorescence intensity distributions of HEK293 expressing recombinant stac2 or stac3 probed with anti-stac1 were indistinguishable from the distribution obtained for untransfected cells. In like manner, probing untransfected HEK293 cells with anti-stac2 antibody revealed minimal baseline staining with mean fluorescence intensity of F- = 266.8 ± 3.46. Exogenous expression of stac2 reveals a population of cells with enhanced fluorescence and mean fluorescence intensity, F-= 822.05 ± 143.9. By contrast, anti-stac2 labeling of cells expressing stac1 and stac3 revealed low fluorescence intensities comparable to the distribution for untransfected cells. These findings highlight the ability of the two antibodies to detect stac1 and stac2 respectively. Analysis of aGPVM revealed endogenous stac2 but not stac1. As an alternative approach, we used western blot analysis to probe the presence of endogenous stac2 in cardiac myocytes. Analysis of untransfected HEK293 cells showed no signal when probed with stac2 antibody. However, analysis of cell lysates from HEK293 transfected with stac2 shows ~ 50 kDa band corresponding to stac2 (m.w. 47 kDa). Similarly, analysis of lysates from freshly dissociated cardiac myocytes show a similar-sized band as with stac2-transfected HEK cells. We thank the reviewers for this excellent suggestion. We could not include an in-depth discussion on apparent discrepancies in our original submission as multiple papers here were only published after our initial submission (e.g. Campiglio et al., 2018 and Polster et al., 2018). The revised Discussion section now includes a subsection entitled “Relationship to prior studies” to compare and contrast these findings. We apologize for our enthusiasm. We have revised the manuscript accordingly. We thank all reviewers and editors for the careful evaluation of our manuscript. We sincerely apologize for the errors and inconsistencies in our text and figures. These were inadvertent and have been rectified. The n values for each figure were verified/corrected, and the figures are also now referenced correctly. 1) Figure 6C control bar is duplicated from Figure 1B. The duplication is stated explicitly and highlighted in yellow. Justification for duplication – in this experiment, we pipette dialyze U-motif into HEK293 cells transfected with CaV1.2 to probe changes in CDI. The appropriate control relation here would be CaV1.2 without the peptide dialysate, which is equivalent to CaV1.2 at baseline. As control experiments in Figure 1A-B also deduced CaV1.2 CDI at baseline (i.e. without stac), we pooled the datasets together. In the previous submission, Figure 6—figure supplement 2B was duplicated from Figure 1—figure supplement 1A. In the revised we have removed this duplication to minimize any confusion. 2) Control bars in Figures 1D, 7E, and 8C are duplicated to facilitate comparison and for symmetry. Justification for duplication – Figure 1D compares CDI of CaV1.3 in the presence of stac to baseline levels. Figure 7E compares CDI of CaV1.3 with the addition of fhf1 to baseline levels, and Figure 8C compares CDI of CaV1.3 with the addition of Mona SH3 to baseline levels. In all three cases, as the appropriate control relation would be the baseline CDI of CaV1.3 under endogenous levels of CaM and without the addition regulatory protein being tested, we duplicated the control bars. In the previous submission, Control r300 relations in Figure 1—figure supplement 1B, Figure 3—figure supplement 1B, Figure 7—figure supplement 7B, and Figure 8—figure supplement 1B were duplicates. We have removed these duplications to avoid any confusion. 3) Control CDImax bar in Figure 7C is duplicated from Figure 1N to facilitate comparison. Justification for duplication – in Figure 1, we compare CDI of NaV1.4 at baseline with stac2 overexpression. Similarly, in Figure 7, we compare CDI of NaV1.4 at baseline with fhf1b overexpression. The duplication here occurs as the control relation in both cases is CDI of NaV1.4 at baseline with addition of an auxiliary regulatory protein. In the previous submission, the CDI – Ca relationship for NaV1.4 at baseline was duplicated in Figure 7—figure supplement 1B from Figure 1—figure supplement 1G. This has been removed from the revised version to minimize confusion. 4) Control traces in Figure 3—figure supplement 1C was duplicated from Figure 3A to preserve symmetry of the figure and for ease of comparison. We left this duplication intact. Justification for duplication – the supplementary figure like the main text figure shows that CaM fusion protects from dominant negative CaM, a competitive inhibitor of CDI. Figure 3—figure supplement 1C shows exemplar traces in the presence and absence of dominant negative CaM to be able to visually compare kinetics of inactivation. The steady state values are reported in panel D.
We thank the reviewer for these comments and for the careful reading of our manuscript. We also apologize for the confusion. We realized eLife requested that we incorporate track changes for resubmission only after we had made substantial textual changes. As such, we attempted to reincorporate our changes that then led to errors. We have corrected these in the revision and have also removed track changes here. We are not sure how to number the figures as we had to submit these separately as individual image files. We thank Deborah DeSilvestre, Rebeca Joca, and Travis Babola for assistance with immunohistochemistry, Hikeki Nakamura for confocal microscope training, Trudeau lab (Ashley Johnson and Sara Coddin) and Colecraft lab (Travis Morgenstern and Scott Kanner) for western blotting expertise. We are grateful for insightful discussions with the Calcium Signals Laboratory and Inoue Synthetic Biology Lab. Finally, we are indebted to the inspiration of Dr. David T Yue, who taught us to pursue science with a passion for the truth. This work was supported by grants from NINDS (DTY, IED, TI), NIMH (DTY, MBJ), NHLBI (GFT) and NSF (JN). Animal experimentation: This study was performed in strict accordance with the recommendations in the Guide for the Care and Use of Laboratory Animals of the National Institutes of Health. All of the animals were handled according to approved institutional animal care and use committee (IACUC) protocols of the Johns Hopkins University (GP15M172). The protocol was approved by the Committee on the Ethics of Animal Experiments of the Johns Hopkins University. All surgery was performed under sodium pentobarbital anesthesia, and every effort was made to minimize suffering. © 2018, Niu et al.